29 Dec – Ewing toasts industry after ‘hugely successful’ Year of Food and Drink. Scotland’s tourism industry stands in good stead as the Year of Food and Drink draws to a close and the Year of Innovation, Architecture and Design begins, Tourism Minister Fergus Ewing said today. 23 Dec – We wish our readers a Merry Christmas. We hope you all enjoy the holiday. 23 Dec – A large planned transformation of Granton Harbour said to be worth £300m to the economy has been given the go-ahead. 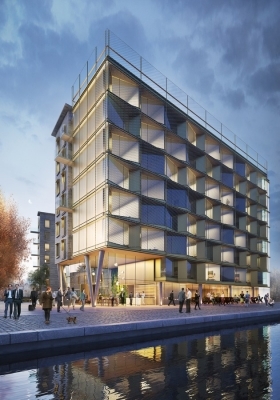 Edinburgh Marina will feature a 300-berth dock, 2000 homes and retail space. 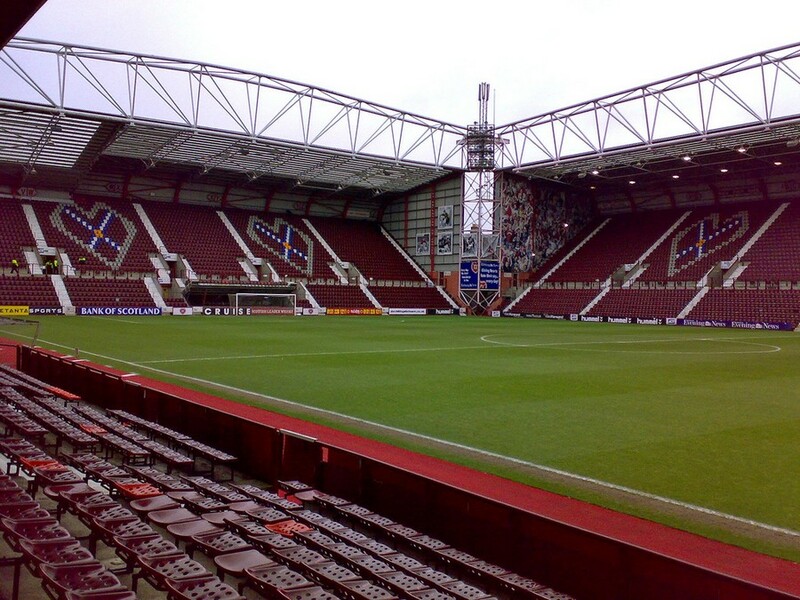 Developers are Granton Central Developments Limited. 22 Dec – A major development by architects Fletcher Joseph Associates and landscape architects HarrisonStevens has been lodged with planning for the long-neglected site between Argyle House and Edinburgh Castle. 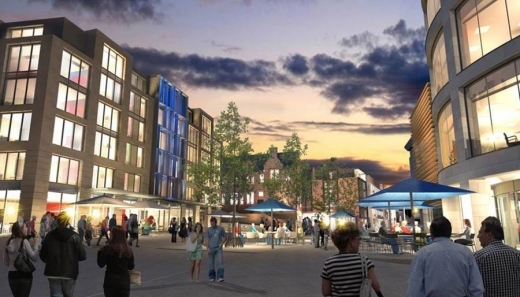 The developers are a joint venture between Peveril Securities – the development arm of the Bowmer and Kirkland Group – and Campus Development Management. 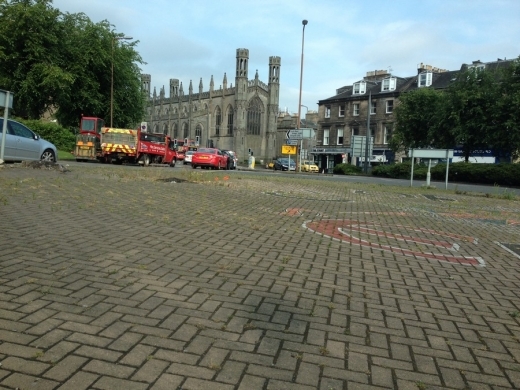 The site has been taken under-option from City of Edinburgh Council, reports Construction News Scotland. The design is by architects Fletcher Joseph Associates, landscape architects HarrisonStevens and specialist student accommodation provider Campus Development Management. The proposed mixed-use development will include a hotel; studios, one and two bedroom flats (including 25 per cent affordable housing); student accommodation, a new public square with café to the foot of King’s Bridge and an arts facility. The current mix of buildings on the site – formerly council offices, storage premises and workshops – have lain vacant since 2009 and were put on the market last year by the council, who deemed them surplus to requirements. 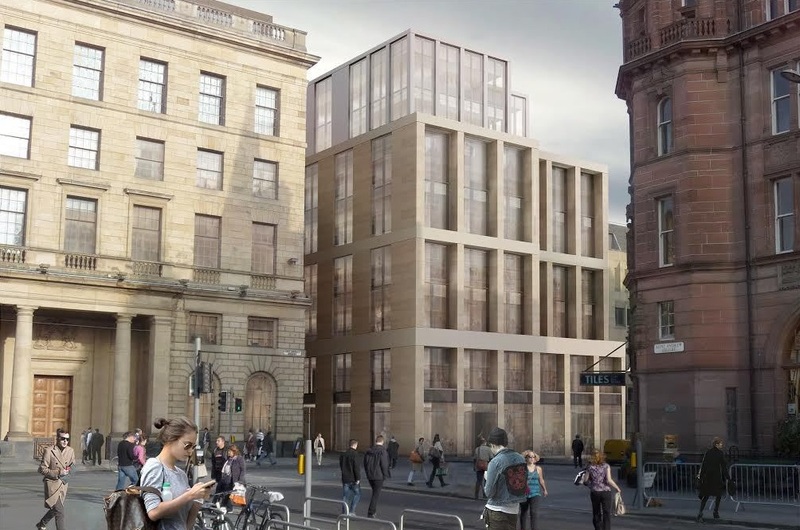 Peveril Securities is currently working with Standard Life on a development in St Andrew Square to deliver office, retail and residential. 22 Dec – The Forth Road Bridge is to reopen on Wednesday after temporary repairs were completed ahead of schedule, reports the BBC this morning. It will open at 6am to all traffic except HGVs. It should reopen to HGVs in mid-February. 22 Dec – Plans have been submitted to encase the Inverness Museum and Art Gallery with aluminium cladding to improve the environment in front of the castle in advance of the long term proposals for the castle and surrounding areas, reports Construction News Scotland. 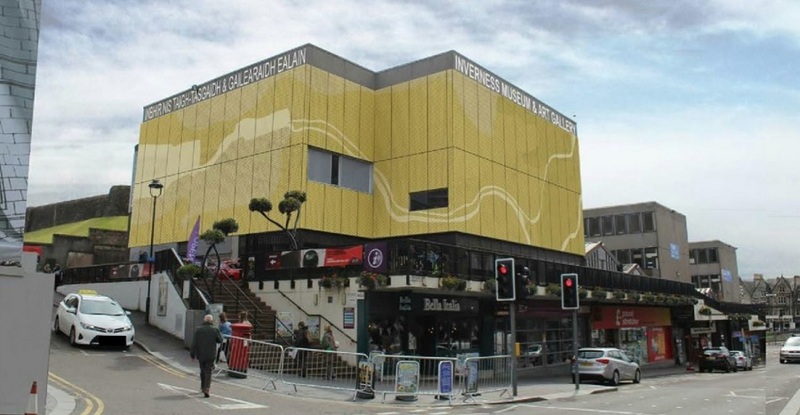 The Highland Council, working in partnership with High Life Highland, said the “bold, eye catching” cladding will enhance visibility of the existing building and will provide greater awareness of the museum to visitors and tourists. 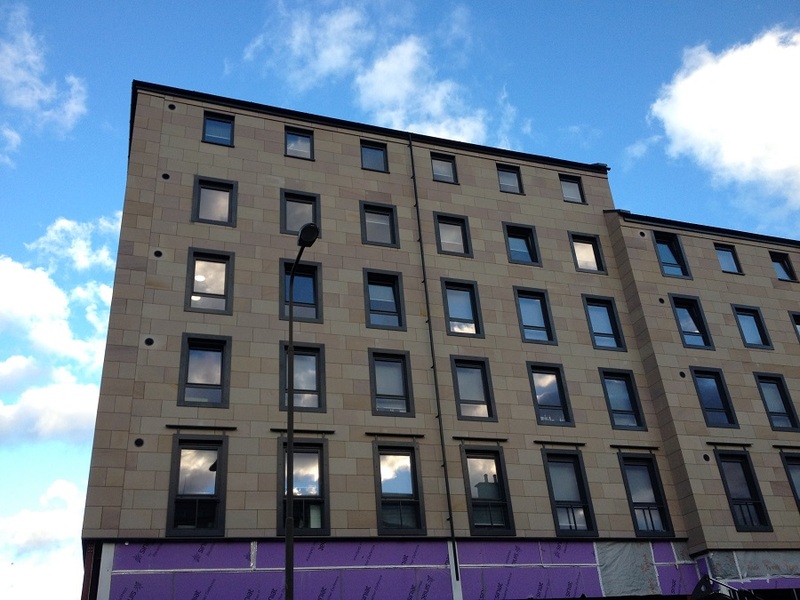 Designed by local architects Three sixty Architecture, the cladding will be made from maintenance-free light sandstone coloured anodised, perforated aluminium to complement the neighbouring stone of the Town House building. Given the light reflective properties of the wrapping, it will change appearance throughout the day and night. 21 Dec – The Glasgow Women’s Library in Bridgeton has opened following refurbishment designed by Collective Architecture of a B listed Carnegie library, one of seven to be donated to the city by the industrialist. 20 Dec – The last remnants of Cockenzie Power Station have been demolished. Over the next six months, work will take place to clear materials from the site and remove the old office and other ancillary buildings. 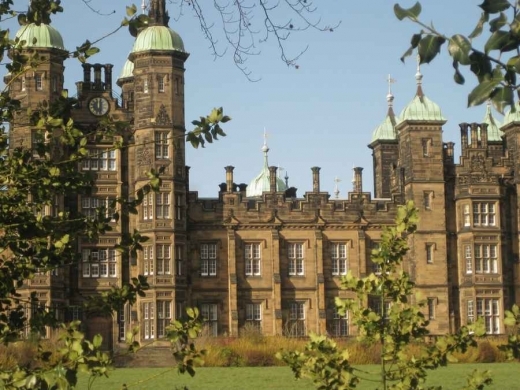 18 Dec – Plans to transform the building formerly home to Donaldson’s College in Edinburgh into over 100 homes have received planning permission by the City of Edinburgh Council. 17 Dec – Rejection for New Hotel for the Royal High School Site scheme by Hoskins Architects. 16 + 15 Dec – Three new perspectives illustrating the alternative scheme for Edinburgh’s old Royal High School have been published by the Royal High School Preservation Trust. 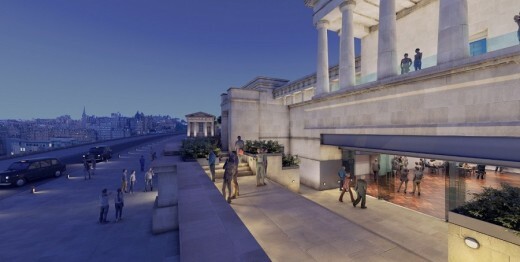 16 Dec – New images added of the new Hotel for the Royal High School Site by Hoskins Architects. 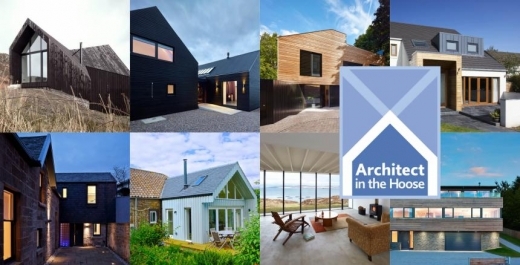 15 Dec – Industry body Homes for Scotland has opened up entries for its refreshed and refocused 2016 awards scheme, designed to showcase the sector’s achievements in building homes that meet a diverse range of needs and aspirations. 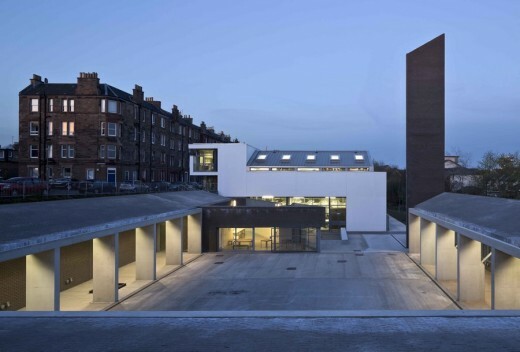 15 Dec – The Glasgow Institute of Architects is pleased to announce the 2015 GIA Design Awards winners: 51 entries from 33 practices, 7 categories including conservation and small works, and 3 special awards. Maggie’s Lanarkshire by Edinburgh architects Reiach and Hall won not only the GIA Supreme Award but also the Wood for Good Award and the Healthcare Award. 15 Dec – Engineers are working towards having the Forth Road Bridge open to traffic in the first week of January. Bridge operator Amey said the date of January 4 was dependent on the weather, but said the work was on track. Seven days were needed for the assessment and design of the repair to the bridge before three weeks of engineering work. The bridge was closed to all traffic on after a crack was discovered in a truss under the carriageway. Plans to fix the problem, which involves a plate welded repair to the damaged truss end link and jacking the link into position, were checked and verified by two independent specialist engineering firms last week. An access platform was constructed to allow teams of welders to work day and night when weather conditions permit as work on the exposed area cannot be carried out when wind speeds exceed 35mph. 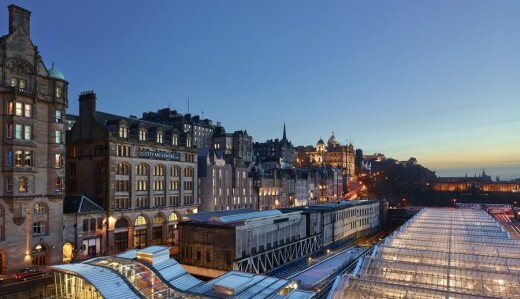 15 Dec – A major redevelopment of Waverley Station has been announced with a new mezzanine level to free space for more platforms has been proposed by owner Network Rail. The proposal is designed to cope with passenger numbers due to rise by 114% between 2012 and 2043. The plan is contained within the Scotland Route Study that considers expansion and improvement of Scottish railways. A mezzanine at Waverley would facilitate “safe and easy station navigation and relocated retail/passenger facilities, to allow more platform capacity for trains”. 15 Dec – A disused church on Edinburgh’s Pennywell Road, Muirhouse, is to be demolished and replaced by new build student housing under plans submitted by EMA. 15 Dec – A free lecture by Neil Baxter Hon FRIAS, Secretary & Treasurer, The Royal Incorporation of Architects in Scotland, took place yesterday at the National Museum of Scotland, Edinburgh. Founded in 1916 at a dinner honouring Sir Robert Rowand Anderson, the Royal Incorporation of Architects in Scotland (RIAS) was, with Holyrood Palace, a main beneficiary of Anderson’s Will, five years later. For its centenary, the Incorporation is preparing the largest celebration of the ‘mother of the arts’ ever seen – with public events the length and breadth of Scotland, highlighting the crucial importance of a quality built environment to all of our lives – and to generate a lot of fun. 14 Dec – Approval has been given for a 13-storey new accommodation facility at former Triple Kirks site in the heart of Aberdeen. The project is designed by local architects Halliday Fraser Munro. 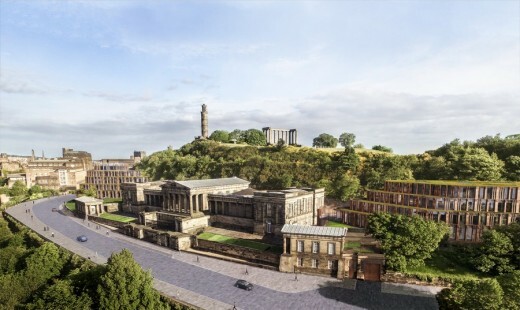 11 Dec – Edinburgh council planners have urged councillors to reject proposals to transform the former Royal High School Building into a £75m hotel, jointly developed by Urbanist Hotels and Duddingston House Properties. The planners consider the proposal would have “a significant adverse impact on the character” of the site. The project managers will be Faithful and Gould and the architects will be Bennetts Associates. 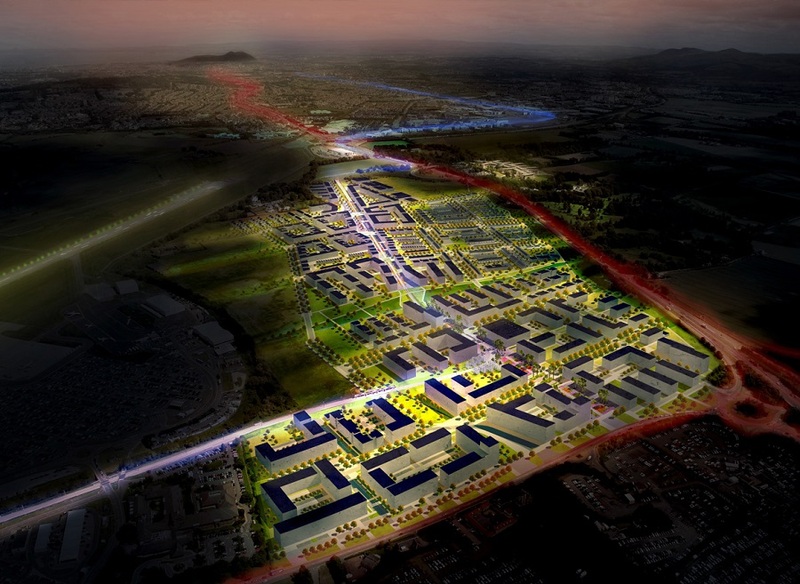 11 Dec – Developers have submitted plans by 7N Architects for the first phase of a £700m new district which will see a business park at Edinburgh Airport. 2016 will be a very special year for the Edinburgh Architectural Association Awards: it is the Centenary year of the RIAS and the year of the Festival of Architecture 2016; a year-long festival celebrating the best of Scottish architecture. 11 Dec – Plans to build a £333m exhibition and conference centre in Aberdeen have been approved by councillors. Developer is Henry Boot and the architects Keppie Design. 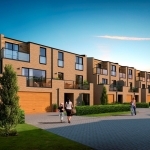 10 Dec – Miller Homes have drawn up plans by Architects EMA for a development of 214 homes arranged over five blocks at Bonnington Village on a site presently occupied by warehousing. 10 Dec – Plans to fix the problem which forced the closure of the Forth Road Bridge have been finalised. Amey engineers have been working around the clock to develop a solution to the crack on one of the bridge’s truss end links. The architectural historian Tom Parnell will discuss the 20th century urban history of the St. James Square area. Docomomo Scotland’s last event in 2015 – mulled wine and mince pies from 6pm. 8 Dec – Alternative proposals to redevelop the former Royal High School into a new music school have been formally submitted by the Royal High School Preservation Trust. 8 Dec – The Scottish Government rejects a request to call-in plans for a £140m film and television studio development in Midlothian. Developers PSL Land Ltd’s attempt to speed up a planning decision on their proposals was made after it claimed the council failed to decide on the campus within their stated time frame. The facility would be Scotland’s first purpose-built film studio complex. 8 Dec – The closure of the Forth Road Bridge could have been avoided if it were not for the “incompetence” of government agency Transport Scotland, claims engineer John Carson: he condemned the government agency for ditching plans to strengthen part of the bridge five years ago adding that Friday’s closure could be directly linked to that decision. 7 Dec – The Royal Incorporation of Architects in Scotland’s (RIAS) list of the top-100 buildings in Scotland from the last century has been released. 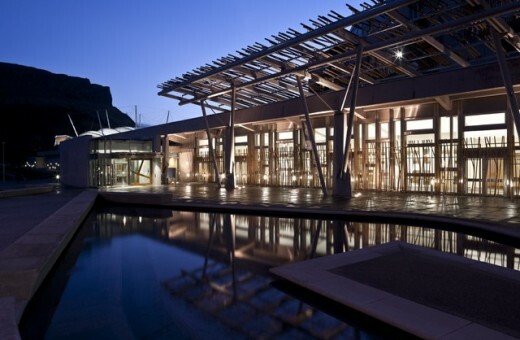 The list includes the Scottish Parliament Building and Stirling University. The public will now have the chance to vote for their favourite building as part of the Festival of Architecture next year. 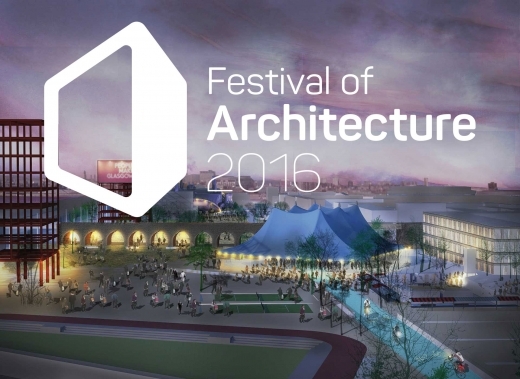 The Festival is the cornerstone of Scotland’s Year of Innovation, Architecture and Design. The Scotstyle list, which features buildings from 1916 right up to the present day, has been compiled by RIAS as a celebration of Scottish architecture. The exhibition Scotstyle will be touring around the country in 2016 to give the public a chance to view and vote for the properties. The venues for the exhibition won’t just be galleries or libraries, it’s going to railway stations and shopping centres, so that people from all walks of life can appreciate these buildings and vote for their favourite. The list was selected from more than 400 nominations put forward by members of the public, with a group of architects, critics and architectural historians whittling it down to 100 properties. Now the public can once again get involved by voting for their favourite to be named as the best building in Scotland of the last century. 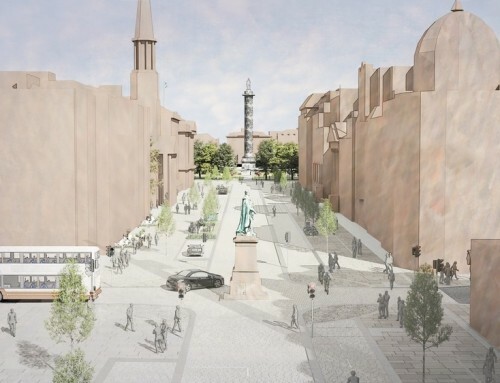 7 Dec – City of Edinburgh Council has given the green light to a £60m Chris Stewart Group regeneration project. 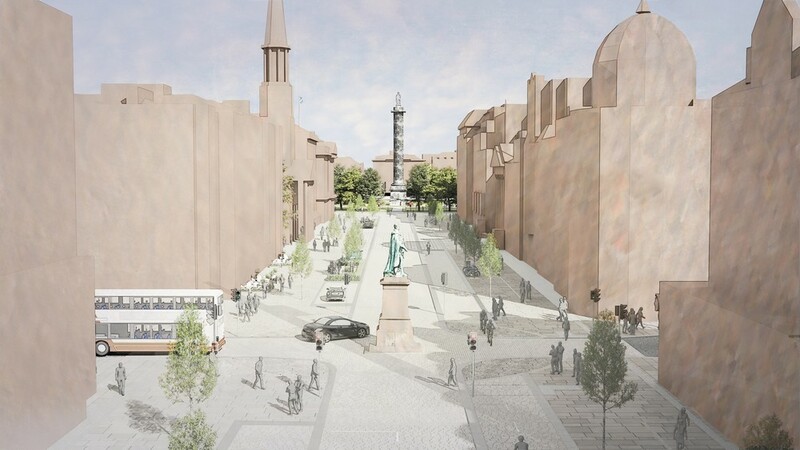 Approval of plans for The Registers, an area to the south east of St Andrew Square, will see two important heritage buildings given a new lease of life, new office accommodation and street level shops, bars and restaurants. The Council approval followed an extensive consultation period and the presentation of robust evidence backing the development. The mixed-use scheme will create a vibrant and complementary mix of new offices, hotel, residential / serviced apartments, retail units and restaurants. As part of the plans, 90% of the listed fabric of the site will be restored, including two key historic listed buildings currently on the ‘at risk’ register. New life will be given to one of the most important art deco banking halls as a restaurant at the neo-classical 42 St Andrew Square and reinstating a former warehouse at 28 West Register Street into active commercial use while preserving its remarkable Venetian Gothic façade. Buildings along part of West Register Street will make way for c. 60,000 sqft of much needed high quality Grade A office accommodation, designed to attract new businesses to the city and essential to the rejuvenation of the area, which forms an important gateway to the new St James development. The intention is to start work on site in early 2016. 4 Dec – The Forth Road Bridge is to shut until the New Year for repairs following the discovery of defective steelwork. The decision to close has been taken after inspections carried out by specialist engineers and following advice and assessment of the fault by independent experts. A range of options for carrying out the repair work has been considered including running traffic on the bridge while repair work is in progress. 4 Dec – One of the UK’s leading infrastructure firms today announced it has engaged with over 12,000 youngsters this year in an attempt to bolster numbers entering the construction industry. Robertson Group, which has 18 companies within its portfolio, will celebrate its achievement at 1pm today at a Get into Engineering awards ceremony in Glasgow – organised in conjunction with Clyde Gateway and University of West of Scotland. 2 Dec – The Festival of Architecture 2016 launched this morning on Calton Hill, photos by Adrian Welch. 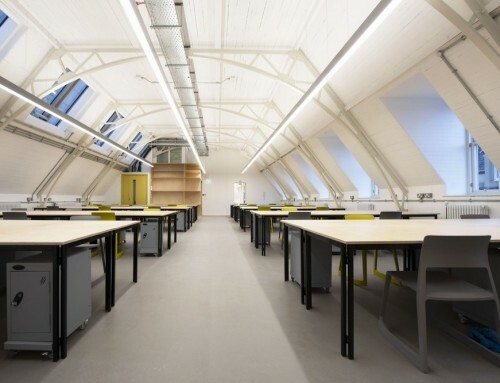 1 Dec – Scotland based fit-out contractor Morris & Spottiswood has completed a £380k redevelopment project to help transform Edinburgh’s Scottish Poetry Library Building. 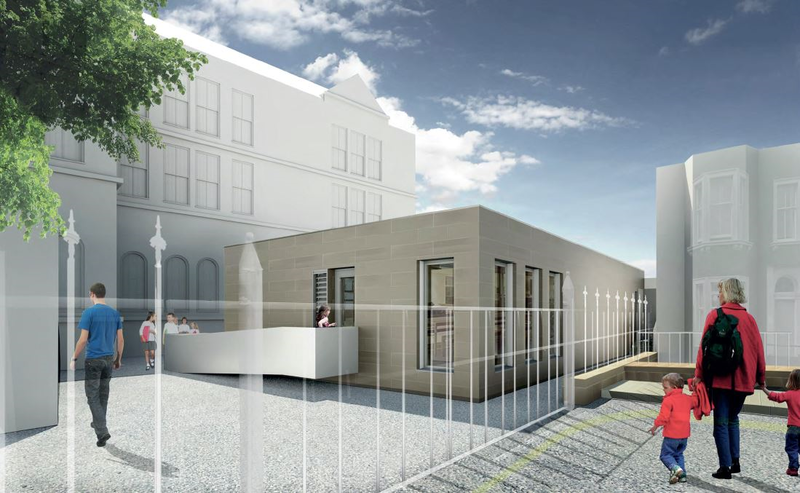 23 Nov – Images have been unveiled showcasing the new facilities set to be built at four Edinburgh schools to cater for the roll-out of free school meals, reports the Edinburgh Evening News. Under plans lodged today, Cramond, East Craigs, Towerbank and Sciennes primary schools will all get new halls to allow them to safely seat their pupils together during meal times. 18 Nov – The Scotch Whisky Association’s new bespoke and contemporary HQ at Quartermile 2 has been completed, providing the Association with a workspace fitting of an industry enjoying worldwide success. 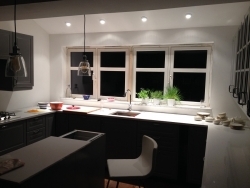 14 Oct – images of the three lighting conditions in this kitchen extension: rolling diary of black timber house extension in East Lothian. 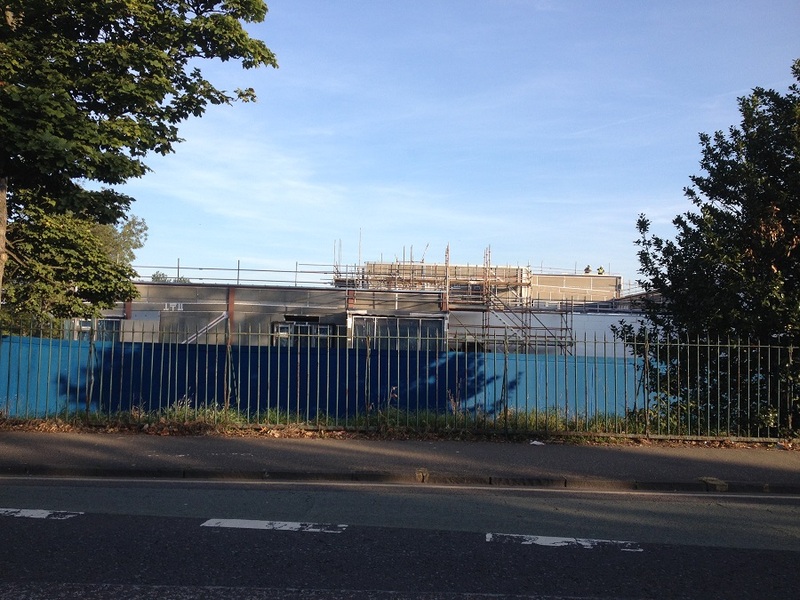 30 Nov – Ashwood has commenced work on a £2.25m sports hall extension at Liberton High School, Edinburgh, incorporating an enlarged gym and dance hall as well as new changing rooms, reports Urban Realm. 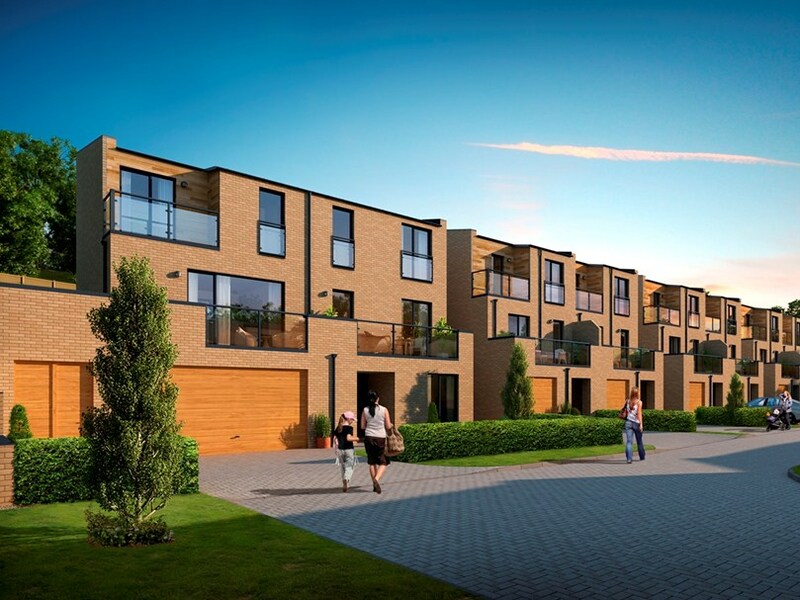 27 Nov – CCG and EDI Group PARC Craigmillar have submitted proposals for 121 terraced and flatted homes at Niddrie Mains Road, Edinburgh, reports Urban Realm. 30 Nov – Developers behind the £75m hotel development at Edinburgh’s historic Royal High School Building are claiming public backing for the project following a survey of local residents, reports Urban Realm. A total of 5,000 people across 12 city wards were quizzed on the plans, the fourth such consultation to be carried out since the project began, with 93% agreed that a hotel was a suitable end-use and 92% backing the proposed Hoskins Architects design. Comments welcome. 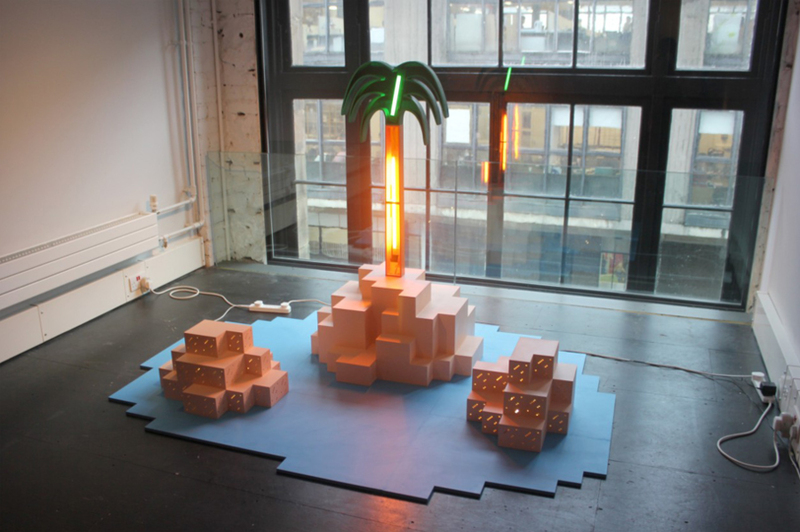 30 Nov – ‘Departure’, first show at Ocean Terminal: Established in 2013, Interview Room 11 is an artist-led gallery based in Edinburgh. For the past three years they ran a gallery space at the Argyle House, the 60s brutalist office building and former job centre in the heart of Edinburgh, as part of Forest Center Plus with studios and working facilities for over 80 artists. 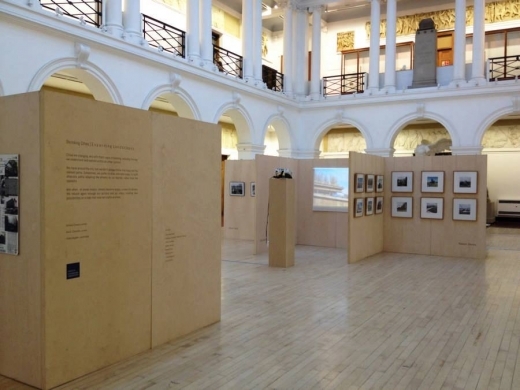 In Edinburgh (page 54-) two major international exhibitions are described, centrepieces of the Festival of Architecture 2016 to be staged in central Edinburgh and the National Portrait Gallery: Cities Expo and Portraits Placed (how architects’ lives and their work are connected and have helped to shape Scotland’s towns and cities). The former is due to take the shape of a pavilion (possibly in Festival Square or on The Mound), designed by the winner of an architectural competition. The Cities Expo would showcase up to 20 international cities, ie 20 small pavilions. 30 Nov – Edinburgh World Heritage, in partnership with Napier University and the city council, is to give 12 Old Town closes a lighting focussed makeover including new artwork and public realm enhancements. In a demonstration of the £380k project the organisation has prepared a demonstration installation outside its Bakehouse Close base to illustrate how considered lighting design can encourage greater pedestrian use. 27 Nov – Developers behind plans to create a £140m film and television studio development in Midlothian have requested that the Scottish Government call-in their application for consideration claiming the council is taking too long to make a decision, reports Construction News Scotland. Scottish International Studios claimed the local authority’s planning committee failed to decide on the campus set for soon to be delisted greenfield land to the west of the A701 at Straiton within their stated time frame. Comprised of sound stages, a substantial backlot complex, employment land, hotel, power plant, film school and student accommodation, the new development would occupy 86 acres of land between the planned A701 bypass and the current road. 26 + 25 Nov – Scottish builders demand equal housing commitment as Osborne doubles budget to support 400,000 extra new homes by end of decade. As George Osborne today announced what he described as the biggest home building programme since the 1970s to help tackle the “growing crisis of home ownership” in England, Scottish builders immediately called for an equal commitment on housing north of the border. “Whilst we are still absorbing the detail of the Chancellor’s announcement, its sentiment is absolutely clear: to back those who aspire to buy their own home. And the fact of the matter is that, as the Scottish Government’s own research shows, this aspiration applies equally to the majority of Scots. Supporting this ambition by stimulating private sector construction will bring wide-ranging benefits, including boosting affordable housing delivery through the direct contribution our industry makes in this area via planning policy. “The Chancellor has also maintained his commitment to the successful Help to Buy scheme to 2021 and introduced a new tailored version specifically for London. This is in marked contrast to the position here where the announced successor to the Scottish Government’s scheme faces budget reductions of up to 50% and will likely be less accessible to buyers. “We further note the Chancellor’s intent to remove constraints to allow all sectors to play a role in affordable housing delivery as well as his support for SME home builders on planning and finance, something HFS has been in discussions with the Scottish Government on for many months. 25 Nov – A planning submission has been made for a centre of excellence for performing and visual arts on the site of Dundee’s former Head Post Office designed by PagePark Architects, reports Construction News Scotland. 25 Nov – Plans for a new 1500-home village at Riccarton in Edinburgh with shops, a school, and a dedicated transport hub have been unveiled by developers, reports Construction News Scotland. The huge Wallace Land project on a greenbelt site north of Currie were revealed at a recent community meeting. Construction would be phased over 5 to 15 years. The proposals have not yet been submitted for planning approval, as the site is not currently within the city’s Local Development Plan, a blueprint of where homes will be built over the next 10 years. Edinburgh is required by the Scottish Government to build 32,064 homes by 2024, with the draft Local Development Plan earmarking sites at Cammo and Maybury for house building while rejecting proposals from David Murray for a “Garden District” near the airport. 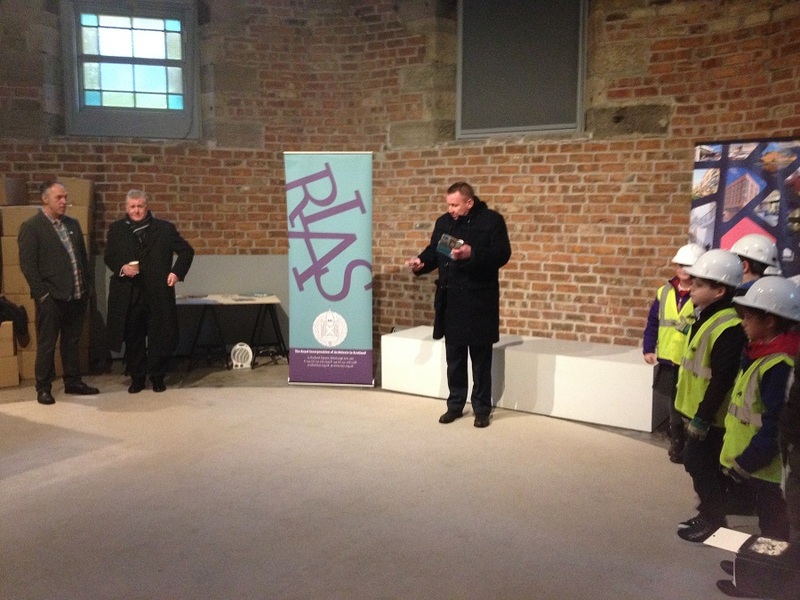 Historic Environment Scotland is a new body created by the merger of Historic Scotland and RCAHMS in 2015. In the next couple of years the Canmore database will be drastically overhauled, resulting in a far better public interface and functionality. 23 Nov – councillors in Edinburgh have agreed that the city’s tram line should be extended by three miles to reach Newhaven at a projected cost of £145m, reports Construction News Scotland. 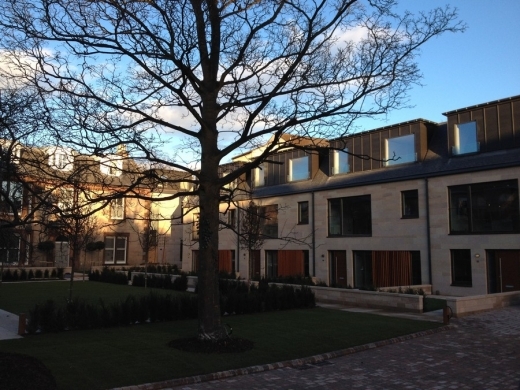 23 Nov – Entries are now being accepted for the Stirling Society of Architects 2015 Awards. Entries close 27th November 2015. 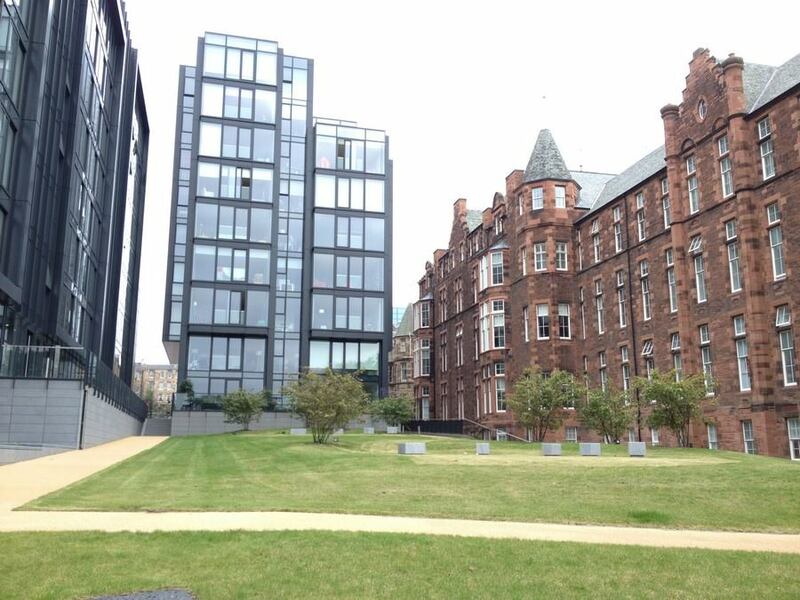 23 Nov – Graham Construction has been awarded the £18m contract to complete the refurbishment of Edinburgh Law School. Work on the Old College Law School Refurbishment Project will begin on 23 Nov 2015 and see Graham onsite at the South Bridge-based campus until winter 2017/18, reports Construction News Scotland. As part of the refurbishment programme, many of the original features of the Grade A-listed Old College building will be retained. A key part of the project will be the creation of a new quadrant library located to the west of the Old College building. Edinburgh Law School, including the current library, is being relocated to the David Hume Tower to allow the work to take place and to ensure there is minimum disruption on campus. 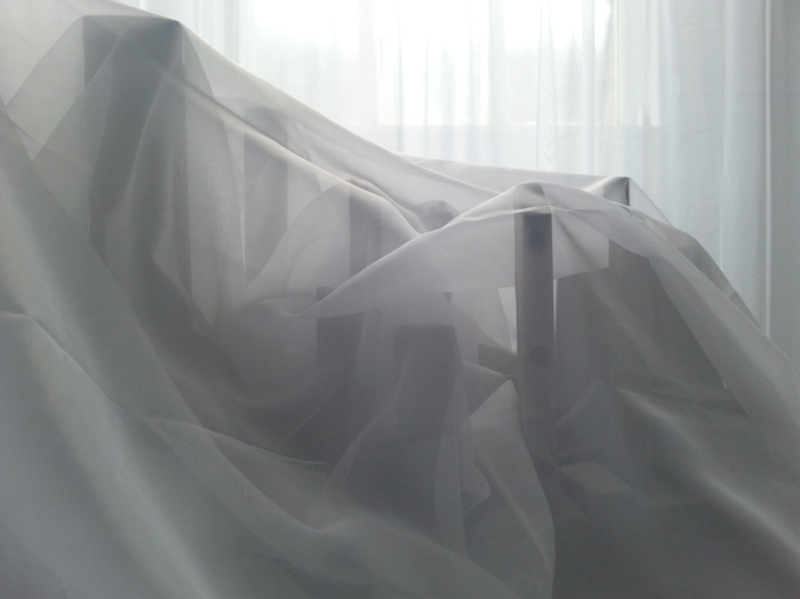 20 Nov – Established in 2013, Interview Room 11 is an artist-led gallery based in Edinburgh, Scotland. For the past three years we ran a gallery space at the Argyle House, a 60s brutalist office building and former job centre in the heart of Edinburgh, as part of Forest Center Plus with studios and working facilities for over 80 artists. 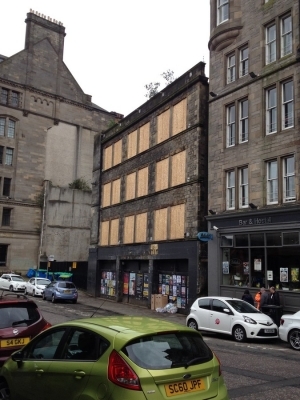 10 Nov – Peveril Securities is on the verge of submitting plans for a mixed use scheme at Edinburgh’s Kings Stables Road. The plans, which are expected to go in before the end of the month, will involve the creation of new homes, student housing and a hotel on the site of a former stables, reports Construction News Scotland. Architects Fletcher Joseph will seek to frame views of the Castle by re-establishing historic building lines whilst creating an active street frontage along King’s Stables Road itself. 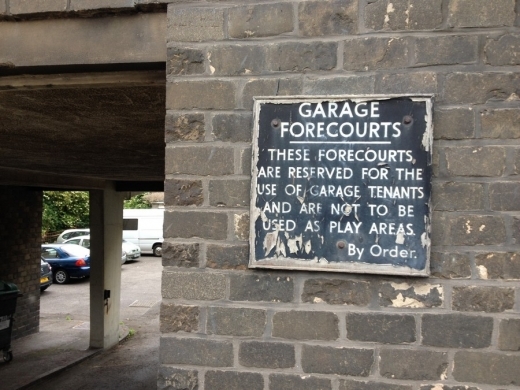 Buildings will be arranged around a series of courtyards and closes to enhance permeability with consideration given to the likely future demolition of Argyle House to form part of a wider master plan. Key changes since the initial application include incorporation of Silk nightclub to the master plan area, enabling a reduction in overall massing and an extension to the central courtyard. 9 Nov – A planning application has been lodged by Sheratan Ltd to build housing, a new primary school and a long talked about park for Edinburgh, reports Construction News Scotland. The area, covering c. 170 acres at the Edmonstone Estate in Little France, will be masterplanned to maximise the benefits to the South East of the City. 6 Nov – Perth and Kinross Council confirmed it has formally withdrawn its listed building application to tear down the iconic Edwardian building. 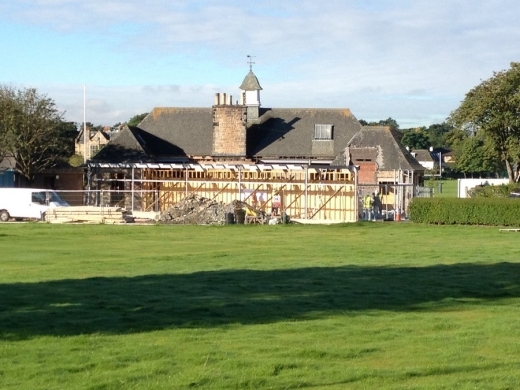 The surprise announcement comes just weeks after councillors backed a plan to convert the hall into a food market, reports Construction News Scotland. But a council spokeswoman said that the planning application had been scrapped for technical reasons, rather than anything more significant. 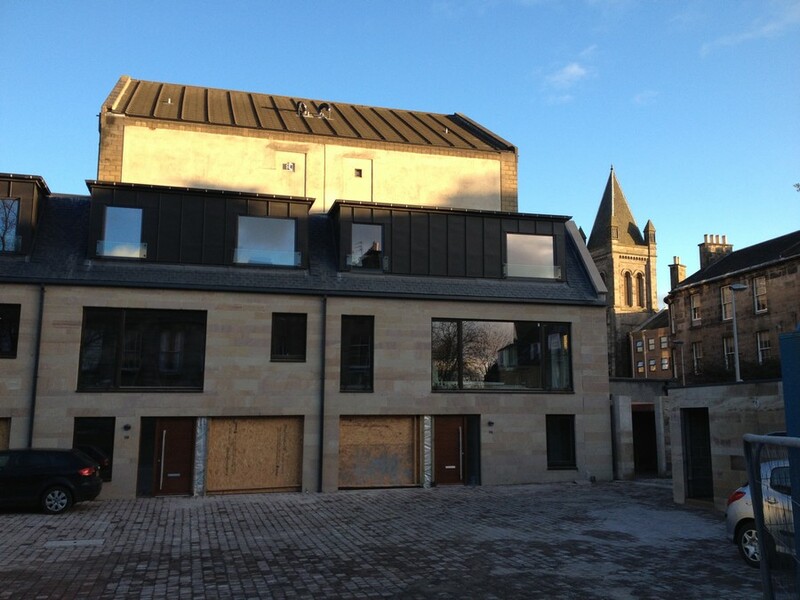 Perth Market Place Ltd has been given until the New Year to prove its project is financially sound. The market plan was backed by councillors ahead of a separate proposal to turn the building into a hotel. 6 Nov – Robertson Homes has unveiled plans to complete the restoration of Gleann Mor House, the listed fire damaged building at its Westercraigs Development in Inverness, to create 26 luxury townhouses and 30 executive apartments. 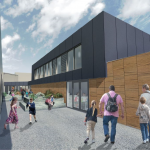 The £13m proposal, submitted to Highland Council last week, would create over 100 local jobs, with Robertson keen to recruit a variety of skills for this development project, thought to be one of the most complex in the city’s recent history. 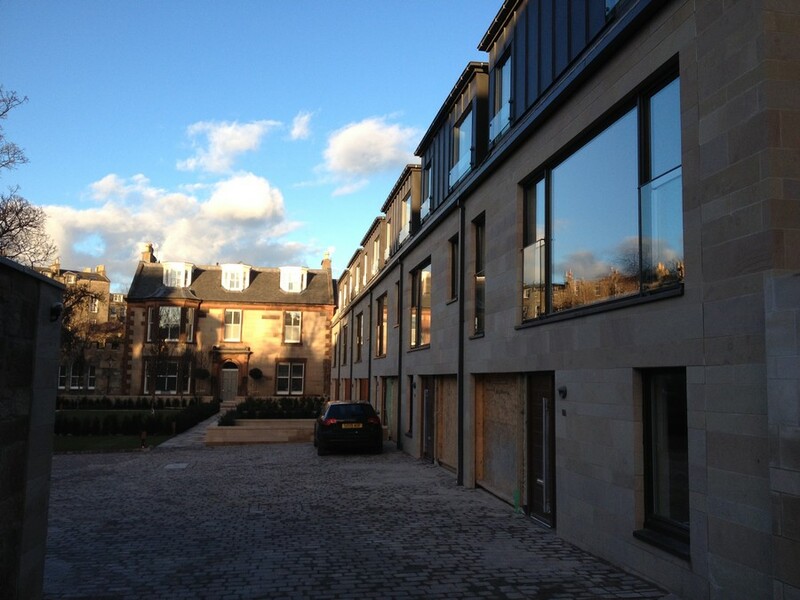 5 Nov – Work is progressing on site at Cramond on the last section of the Caer Amon Housing Development for AMA Ltd. An octagon of terraced housing by Richard Murphy Architects forms a gateway to the development which features, courtyards, apartments and individual houses – many arranged around shared courtyards. This last section is expected to be completed in May 2016. 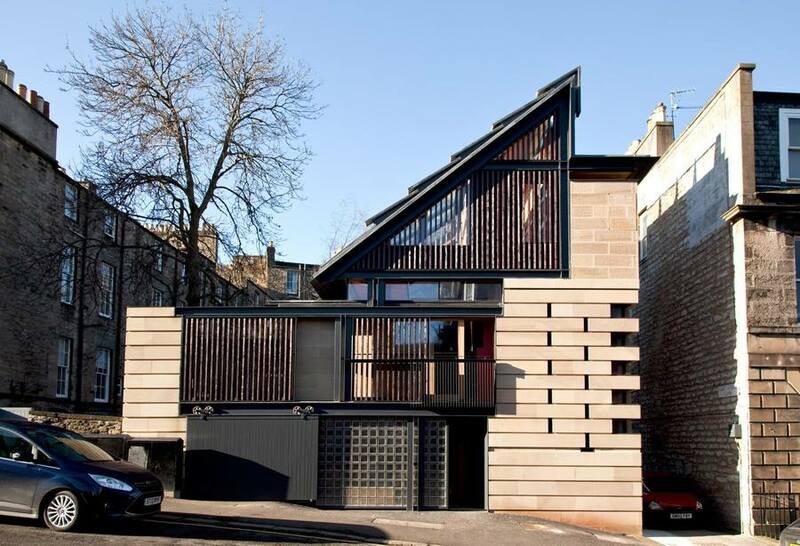 4 Nov 2015 – West Burn Lane, St Andrews by Sutherland Hussey Harris has been awarded the RIAS Andrew Doolan Best Building in Scotland Award for 2015. From a shortlist of twelve projects, all winners of RIAS Awards for 2015 (presented in June 2015), the judges selected West Burn Lane as a clear winner. The award was presented at a ceremony at the National Museum of Scotland (Doolan Award winner for 2011) by the Cabinet Secretary for Culture and External Affairs, Ms Fiona Hyslop MSP alongside Mrs Margaret Doolan Hon FRIAS (the late Andrew Doolan’s mother). 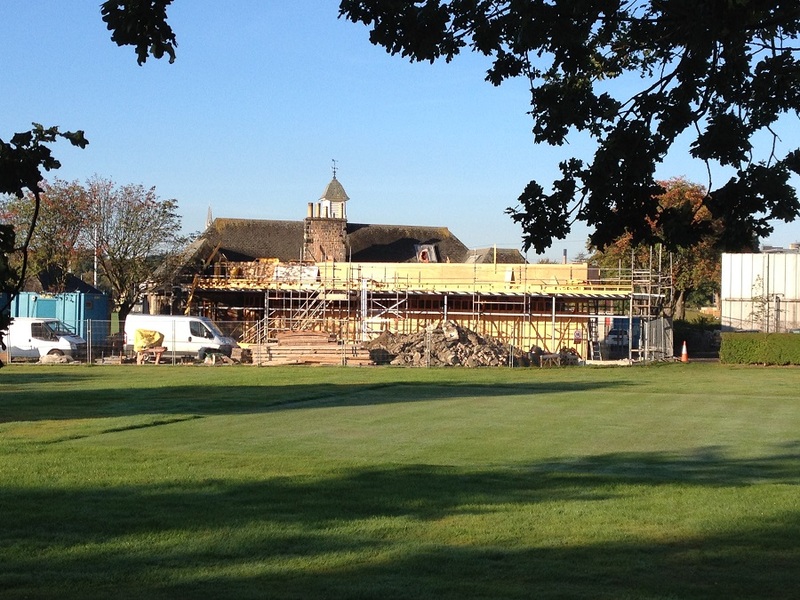 5 Nov – Work is progressing at a pace at Edinburgh Academy on the Rugby Pavilion, which is due for completion early next year. The Rugby Pavilion project follows on from Richard Murphy Architects’ recent completion of the Hockey Pavilion, a new Nursery School and six new classrooms at the Junior School. JCT are giving away £1,000 for your construction idea. Studying in a construction related course? Need to improve your CV and increase your job prospects? All you have to do is give JCT (Joint Contracts Tribunal) a good idea that can solve one of the challenges facing the industry today. You can present your idea in any way you wish, e.g. essay, video, photographic essay, set of designs, drawings, as long as the idea is good, the presentation is up to you. 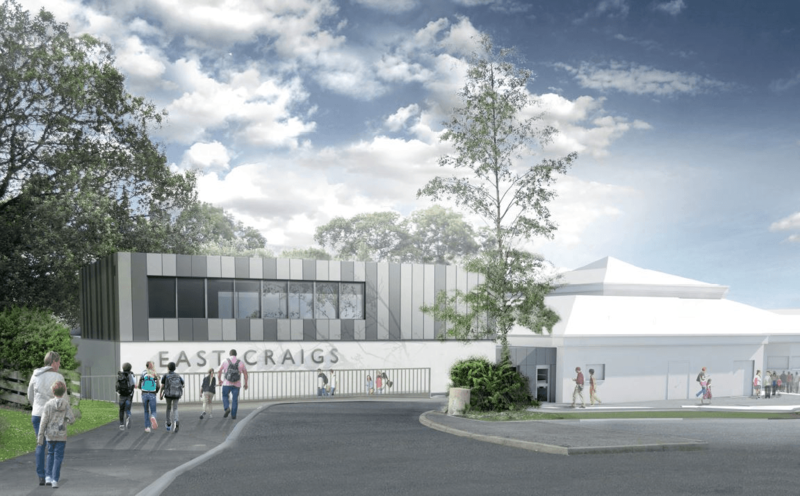 4 Nov – Edinburgh Napier University’s £2.5m rugby academy extension by Smith Scott Mullan Associates starts on site, reports Construction News Scotland. The two-storey development at the BT Sport Scottish Rugby Academy will host a multi-use strength and conditioning gym, rehabilitation space and studio research facility. As well as providing the academy players with a fully-equipped, state-of-the-art gym and rehab spaces – including a 30 metre running track on the ground floor – a second-level studio facility will provide an area where students and academic staff can undertake research projects. 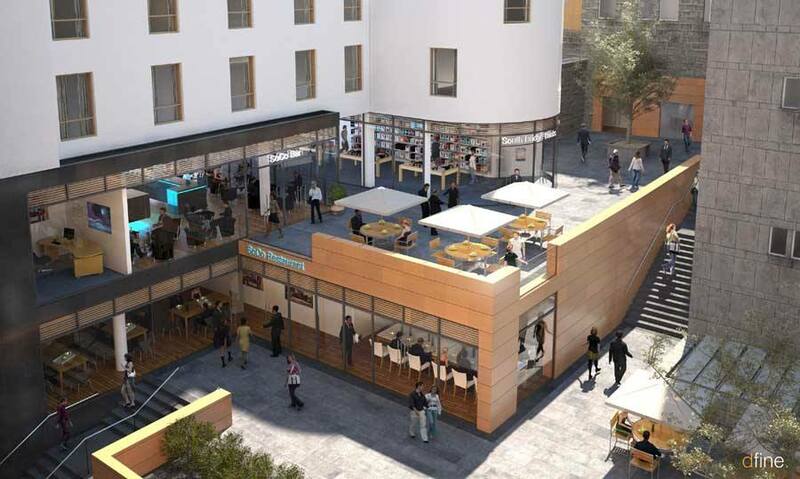 4 Nov – Planning officials have given the green light for a student accommodation development with 221 rooms in Aberdeen, reports Construction News Scotland. Crucible Alba will develop the Michael Laird Architects-designed facility on the site of McConechy’s Garage on Willowbank Road. The building, which will have its main entrance on Willowbank Road, will have 44 flats across four storeys and will include a cafe, games facility and “breakout” room. 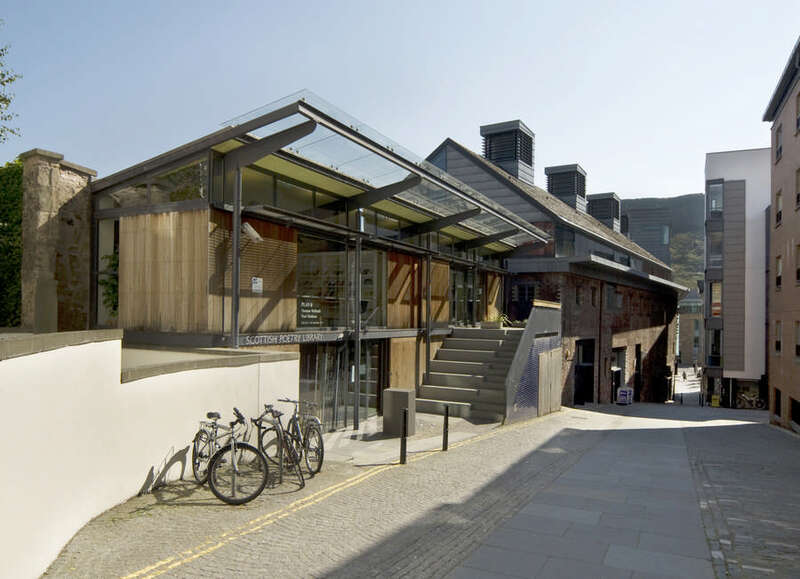 4 Nov – Midlothian Council is to work with partner agencies to improve its funding bid for a £6.5 million arts and theatre complex centre at the award-winning National Mining Museum Scotland, reports Construction News Scotland. 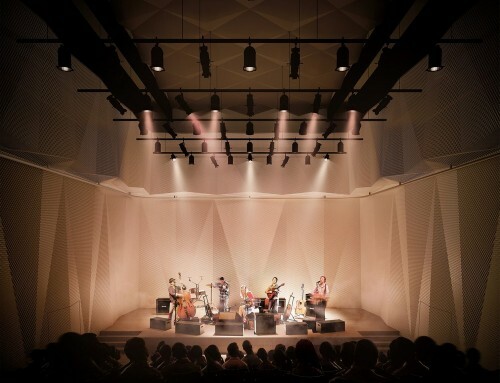 At a full council meeting on Tuesday, councillors agreed to pursue the project, which would create the first theatre in the county for 100 years, despite being turned down for a grant by the government. 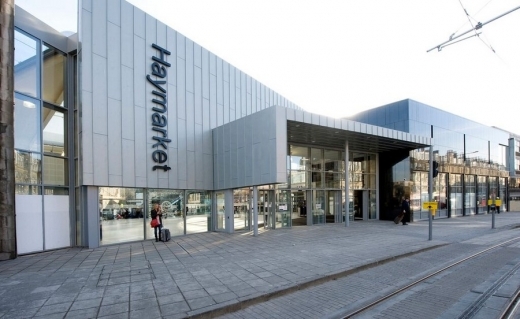 29 + 28 Oct – Scotland’s fourth busiest railway station – Haymarket Station, has been crowned the overall winner of the 2015 Saltire Civil Engineering Awards, following completion of a major refurbishment and extension project. Announced annually, the Awards are a much coveted accolade from the Saltire Society and the Institution of Civil Engineers Scotland recognising excellence and innovation in civil engineering. 29 Oct – A new Academic Centre at Stirling University designed by Page/Park Architects has received planning permission, reports Construction News Scotland. The new building is a joint venture from the INTO University of Stirling Partnership. The INTO students will come from abroad and experience a year of learning language in the new centre, before progressing to a relevant University programme. 28 Oct – Councillors have approved new masterplan documents that will guide the development of a proposed new Aberdeen Exhibition and Conference Centre (AECC) at Bucksburn and the existing site at Bridge of Don, reports Construction News Scotland. Members of Aberdeen City Council’s communities, housing and infrastructure committee also approved revisions made to the planning frameworks following responses made during a six-week period of public consultation. In March it was confirmed that developer Henry Boot would build the £333 million exhibition centre along with two hotels and a clean energy power station in Dyce. 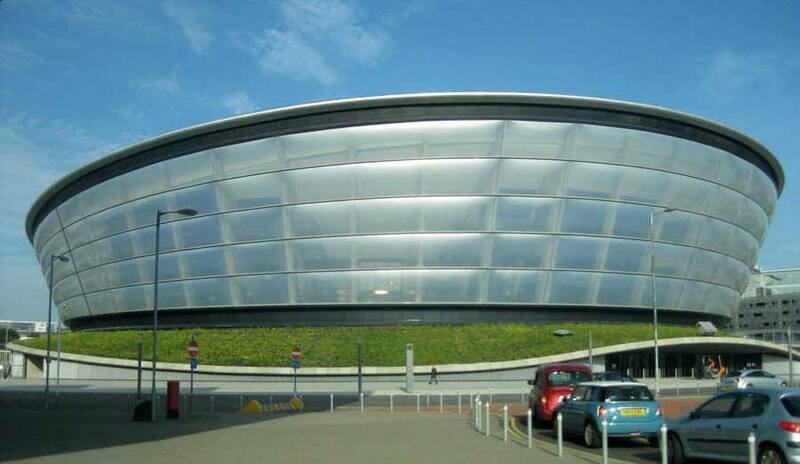 Keppie Design was appointed as architects for the AECC the following month. 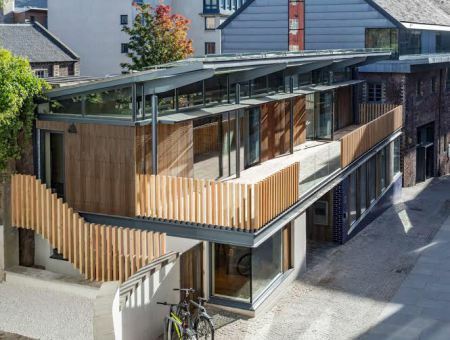 28 Oct – The Edinburgh Centre for Carbon Innovation (ECCI) has become the first refurbished building in UK to achieve a BREEAM rating of ‘Outstanding’, achieving a score of 87.5 per cent, reports Construction News Scotland. 28 Oct – New photos added of this unusual building, the lower part of a chapel built by James III, housing the shrine of St Triduana, a Pictish saint. The Hexagonal vaulted chamber at St Triduana’s is reputedly unique. Located in the Restarig district of Edinburgh, St. Triduana’s Well comprises a low hexagonal building lying next to St Margaret’s Parish Church. 28 Oct – Dundee Waterfront has announced that a total of £600m of investment has been secured for a series of projects in the city including a new marina; railway station, hotel and retail; Hilton Hampton hotel; homes by H&H Properties; a Seabraes pedestrian bridge and offices; expansion of Dundee Science Centre and the V&A Museum of Design, Dundee, reports Urban Realm. 27 Oct – McInnes Gardner Architects have seen off competition from hundreds of entrants to win a Sunday Times Homes Awards competition to solve Britain’s housing crisis. ArcHouse is intended to serve as a template for low-cost volume housing within planned new garden cities which will be built around London with a barn-style aesthetic defined by a curvaceous roof and timber cladding, reports Urban Realm. 27 Oct – The First Minister opened City of Glasgow College’s new £66m Riverside Campus yesterday, reports Construction News Scotland. The Riverside campus is the first phase of a new £228m twin-site supercampus. 27 Oct – Ayrshire College’s new campus project in Kilmarnock has been awarded a BREEAM “outstanding” rating at its design stage, reports Construction News Scotland. 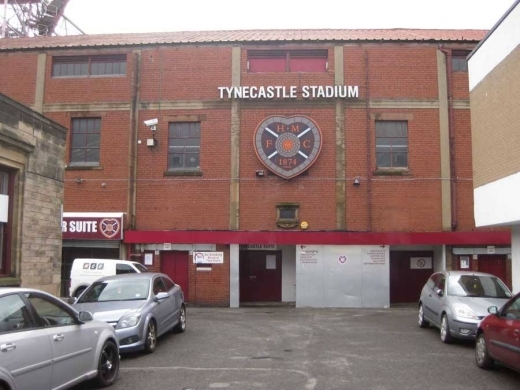 26 Oct – The City of Edinburgh Council has unveiled plans to build 14,000 homes in the next ten years costing the local authority nearly £300m, reports Construction News Scotland. The proposals, which are designed to tackle the city’s growing population, are to be present to the council’s finance and resources committee on October 29. With an estimated cost of £296,443,000, the work includes the infrastructure, including roads and schools, needed to support the new residential developments. 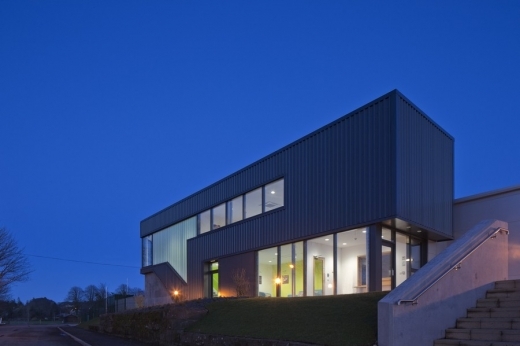 26 Oct – Photos of the new ARKE building for Sabhal Mor Ostaig Gaelic College at Kilbeg on the Isle of Skye on the Glasgow Architecture website news page. The building – designed by Glasgow architects, Holmes Miller and local architects Rural Design – was officially opened by First Minister Nicola Sturgeon on 21 October. 26 Oct – Cruden Homes launch second phase of housing at Craigmillar Cruden Homes have launched their latest batch of housing in Craigmillar, Edinburgh, in partnership with Places for People. 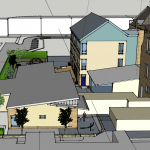 Comprising a mix of one and two bedroom flats and three bedroom terraced villas The View will incorporate HomeZone areas of shared pedestrian and vehicle access with contemporary street frontage and landscaping, reports Urban Realm. 23 Oct – GLM Architects have designed a redevelopment for Port Edgar Marina on the Firth of Forth, reports Construction News Scotland. The £1.2m proposal involves a new restaurant, visitor’s centre and the marina’s yacht club plus the redevelopment of the existing buildings at Port Edgar, located to west of South Queensferry. 23 Oct – Hypostyle-BR Architects have reworked their plans for a whisky experience and distillery within the Pump House Building at Glasgow’s Queen’s Docks, reports Urban Realm. 23 Oct – Graven have completed their eighth airport lounge for British Airways, part of an international roll out of the carriers ‘Galleries’ brand that has previously landed in Edinburgh, Gatwick and Washington Dulles amongst others, reports Urban Realm. 22 Oct – Select Property Group has secured planning permission for a new £41m student accommodation development just east of Edinburgh Quay in Fountainbridge. Operating under the developer’s Vita Student brand, the building will contain 261 studios, a 5,000 sqft social hub area including private study rooms, a movie room and gym. The building is due to open in September 2017, reports Construction News Scotland. The development will also feature three retail and leisure units and marks the final phase of the city’s Fountainbridge Regeneration Scheme which includes retail, office and residential accommodation. 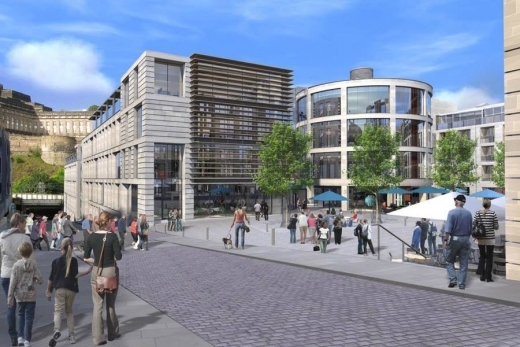 21 Oct – Plans for a new supermarket in Edinburgh have been rejected amid fears the development would lead to increased congestion and poorer air quality, reports Construction News Scotland. Proposed to be located within the St John’s Road Pollution Zone in Corstorphine, the 21,000 sqft store would have had a 140-capacity car park. The road apparently has the worst air quality in Scotland with concentrations of nitrogen dioxide nearly double the legal limit. Over 450 people objected to the supermarket plans by developer Realis Estates. 20 Oct – Dundee City Council has set out a timetable for a school improvement programme totalling around £2.5m, reports Construction News Scotland. A report reveals that more than three-quarters of the 54 school buildings in Dundee have been rated in good or satisfactory condition. Nine of the 13 buildings graded as poor are set to be replaced with the others subject to major investment to bring up their standard. The new build programme includes Harris Academy and primary campuses at Hillside, Strathmartine, Coldside and East End. 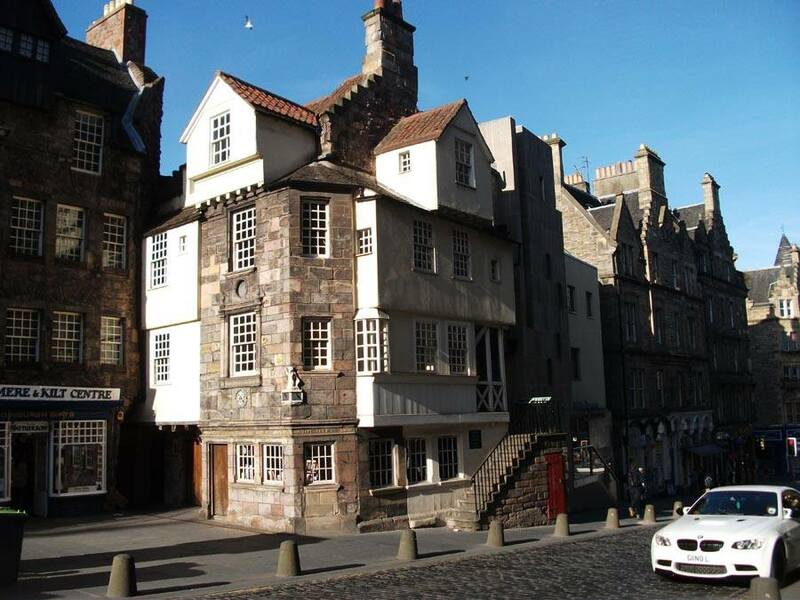 19 Oct – The Advocate’s Close project in Edinburgh has been named as the national Project of the Year by the Royal Institution of Chartered Surveyors (RICS), reports Construction News Scotland. 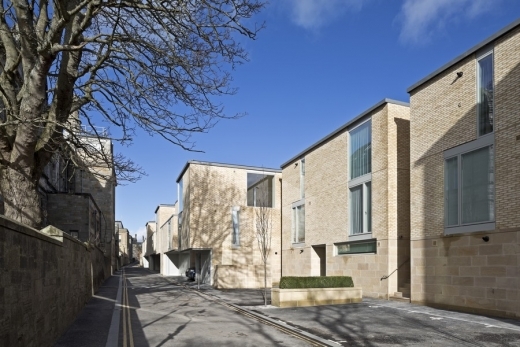 Occupying an historical site within the heart of Edinburgh’s Old Town, the development which was delivered by Thomas & Adamson surveyors and Morgan McDonnell Architecture Ltd for the Chris Stewart Group. 19 Oct – Five projects to restore and reuse historic buildings across Scotland for community facilities have been awarded £1.7m in funding. – the former British Linen Bank is to get a major restoration, as part of a wider scheme to regenerate the surrounding area by the Southside Housing Association, and to provide additional social housing units. – the Edwardian Govan Hill Baths in Glasgow, which is to be refurbished in a phased scheme to facilitate full community usage for three pools, a steamie and Turkish Baths suite. 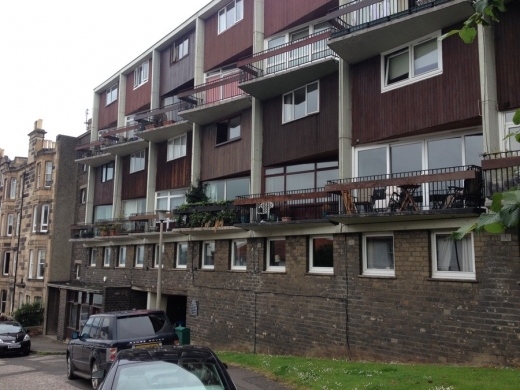 That project received an award of £500,000 to pay for repairs to halt water ingress and refurbish the interior of the building. – the former Dumbarton Academy, which on completion will be utilised as the new West Dunbarton Council HQ, housing over 500 council staff, is expected to bring much needed additional trade to town-centre businesses. – the former Davidson Cottage Hospital in Girvan will receive funding for conversion to an Enterprise Centre for business space, childcare facilities, and office accommodation. – a new use for the Old Achintore School in Fort William has been found, following years of discussions around the building’s potential demolition. 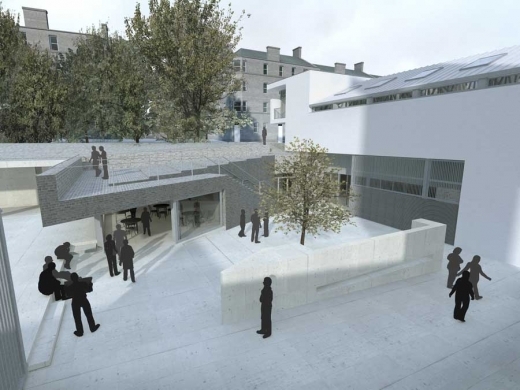 That project received a grant award of £269,750, which will allow the building be refurbished to act as a Civic Centre for the town, and offices for Highland Council staff. 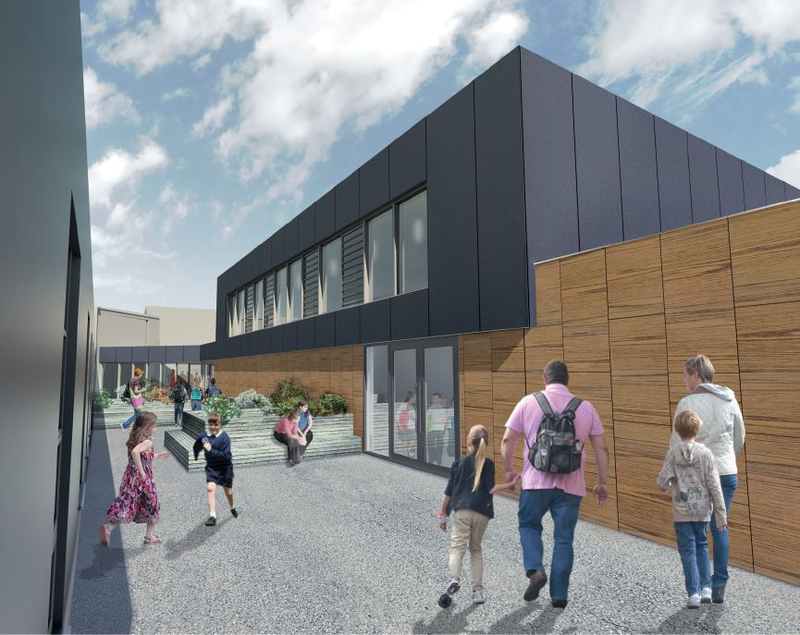 19 Oct – hub North Scotland has announced the practical completion of the new £11.75m Brimmond School in Aberdeen, designed by JM Architects, reports Construction News Scotland. Offering 420 places for primary pupils in addition to 80 nursery slots the school has been and was built by main contractor Ogilvie Construction. The 4,501 sqm school consists of both classroom and administration space alongside a range of outdoor provision including a cycle track, a 3G multi use games area, an adventure playground, a sensory garden and a woodland wildlife area. The facility also has an outdoor dining area, communal open space for non-classroom teaching as well as two roof terraces. AHMM’s transformation of Burntwood School reimagines a 1950’s modernist secondary school campus for 2000 girls and 200 staff. The architects created six new faculty buildings and two large cultural buildings linking original buildings by renowned 1950s/1960s architect Sir Leslie Martin. The Fishing Hut, Hampshire by Niall McLaughlin Architects won the Stephen Lawrence Prize for the best project with a construction budget of less than £1 million. 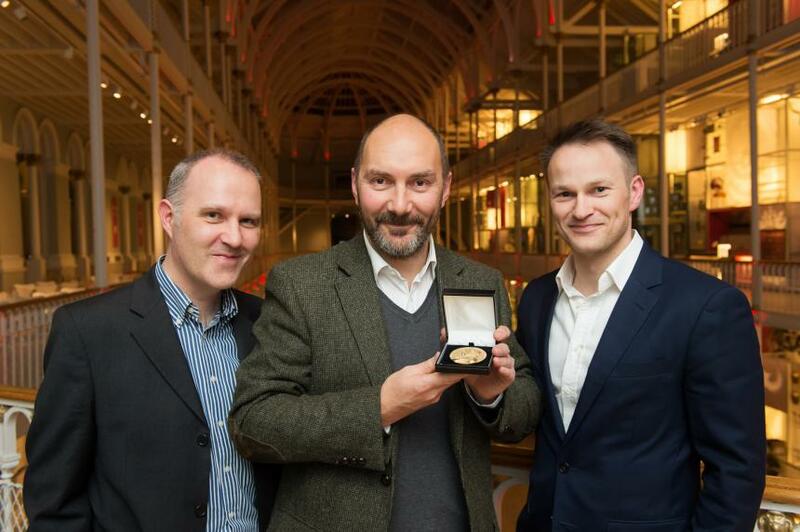 • National Theatre won the RIBA Client of the Year, supported by The Bloxham Charitable Trust. The award recognizes the role good clients play in the delivery of fine architecture. 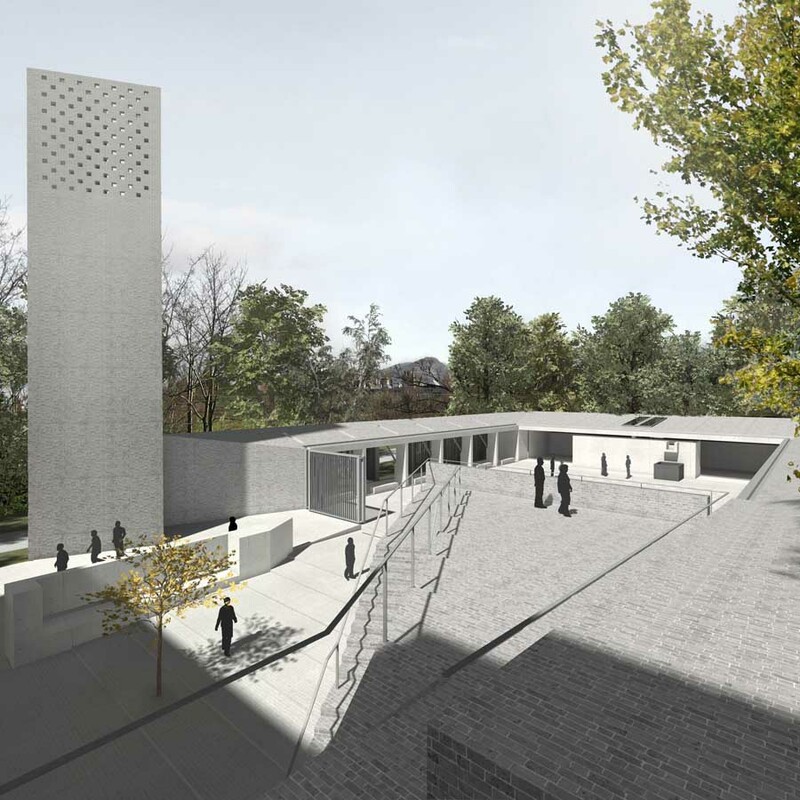 The Whitworth, Manchester won – gaining 38% of all votes, with Maggie’s Centre, Lanarkshire in second place. Tens of thousands of people voted. 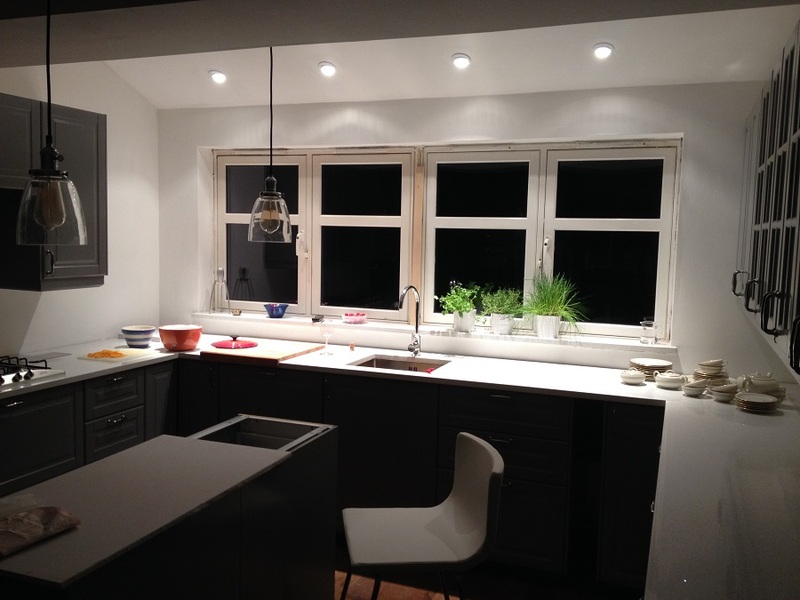 The BBC in partnership with the RIBA invited users to vote for their favourite. The vote is now closed. 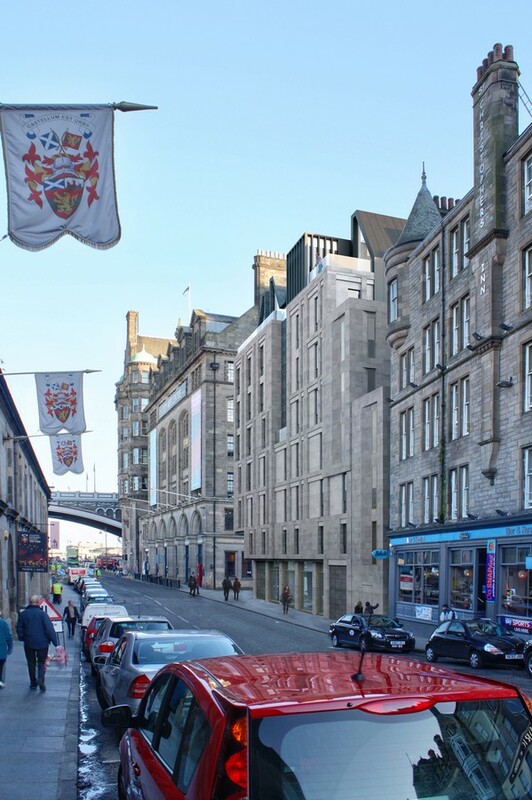 15 Oct – JM Architects have submitted plans to build 91 student residences and commercial space on the north side of Calton Road in Edinburgh’s Old Town on behalf of Buile Developments, reports Urban Realm. 14 Oct – Fascinating article in Scottish Construction News by Edinburgh architect Malcolm Fraser on the sad demise of his pioneering design-led practice. The loss of an architecture practice like this should make the powers-that-be reconsider the whole construction sector and the way the profession of architecture relates to it. Calls for many years, from Sebastian Tombs to Willie Watt and Neil Baxter, have demanded a refocusing on quality away from tickbox cost-orientated procurement. Scotland without a strong range of innovating design-led architecture practices will be weaker: we don’t want our international reputation reduced and much more importantly we don’t want our built environment interventions to reduce in quality. Comments to info(at)edinburgharchitecture.co.uk are welcome. 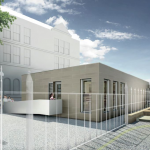 14 Oct – An Edinburgh community group has built a temporary community meeting space in Fountainbridge on the site of EDI’s planned India Quay development, helping to foster a sense of community work ahead of construction work getting underway. Built by Fountainbridge Canalside Initiatiive over the course of a single weekend by a team led by architect Akiko Kobayashi the open source design was assembled from prefabricated components using mallets and pegs, reports Urban Realm. 5 Oct – One of Scotland’s pioneering architecture firms has developed a design manifesto for the country’s burgeoning food and drink industry, aiming to bring the benefits of good design and architecture to manufacturing businesses. 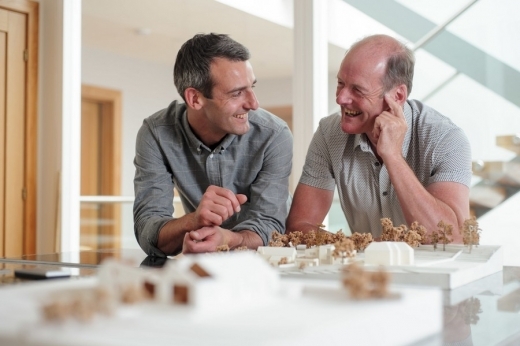 As the food and drink industry takes centre stage for Scotland’s 2015 ‘Year of Food and Drink’, TAP (Taylor Architecture Practice) – run by father and son team David and Neil Taylor – is playing a key role in modernising the food production process in factories across Scotland, with their team of specialists whose technical expertise and design vision delivers buildings of distinction. With clients including Stranraer based Caledonian Cheese Company and Loch Fyne Oysters already under their belt, the benefits of TAP’s approach are becoming evident, both for their clients and for the practice. TAP’s recent renovation of the Castle MacLellan Foods production plant in Kirkcudbright saw a dull, poorly designed factory transformed into a practical, modern and beautiful industrial space, giving owners the extra capacity they required, achieving an immediate productivity increase of 18 per cent, with the team also noting a boost in staff morale. This success has been followed with further commissions, with TAP announcing today their appointment to a £4.5m re-design of a Scottish salmon distribution centre in Larkhall near Glasgow for DFDS logistics. The latest venture will see the practice take forward plans for a significant expansion of the existing depot including a complete revamp of the office and social areas. Working to a tight schedule, the ambitious project’s first phase is due for completion in December 2015. Neil Taylor, Managing Director of TAP, commented: ‘The food and drink industry is an increasingly important part of Scotland’s economy and we believe that there are many benefits to be gained from creating well designed and technically sophisticated buildings for the industry as it grows. Often food production companies come to us with a requirements that are, understandably, focused on the practicalities of maximising productivity. Our view is that if all of the functions; from the reception and offices, to the storage and plant areas, through to the factory floor, can be integrated within an overarching design concept, then this can achieve both the most efficient layout and also a coherent and visually powerful building. At Castle MacLellan this approach has had a huge impact on improving productivity and business culture, as well as providing the business with a building that they can be proud of. Founding the practice in the mid-1960s, David Taylor has had over five decades of experience working in Scottish architecture. Following in his father’s footsteps, son Neil has brought a range of complementary skills to the well-established firm. Endeavoring to give each and every one of its projects a high degree of attention, commitment and care, the team is passionate about combining pragmatism with elegance offering the perfect design solution for clients. From humble beginnings, purveyors of luxury pate, Castle MacLellan Foods, has grown from a small operation producing several tubs a day to a major national force, supplying supermarkets the length and breadth of the country. Established thirty years ago, it continues to be renowned for its expertise in pate making, with its exquisite attention to detail and unwavering commitment to sourcing truly authentic Scottish ingredients. Due to the continued growth of the firm, TAP’s brief was to design and build a substantial extension to the food production factory located on the beautiful banks of the River Dee in Kirkcudbright. 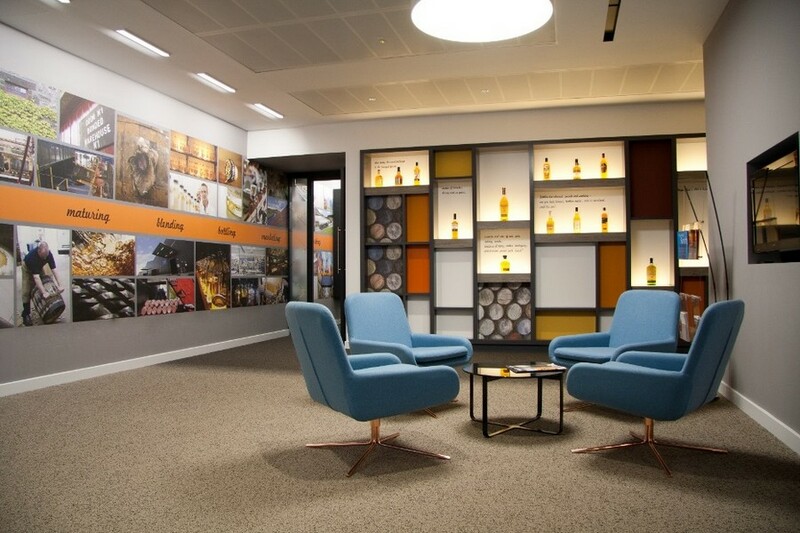 The project involved the addition of new production and storage spaces and extensive refurbishment and reconfiguration of existing internal spaces, external landscaping and on site car parking. A new reception building and bridge link to the upper floor of the existing factory provided a much improved entrance for staff and visitors, addressing the street and adjacent riverside park. TAP worked closely with Castle MacLellan Foods to gain a thorough understanding of the complexities of its operation. 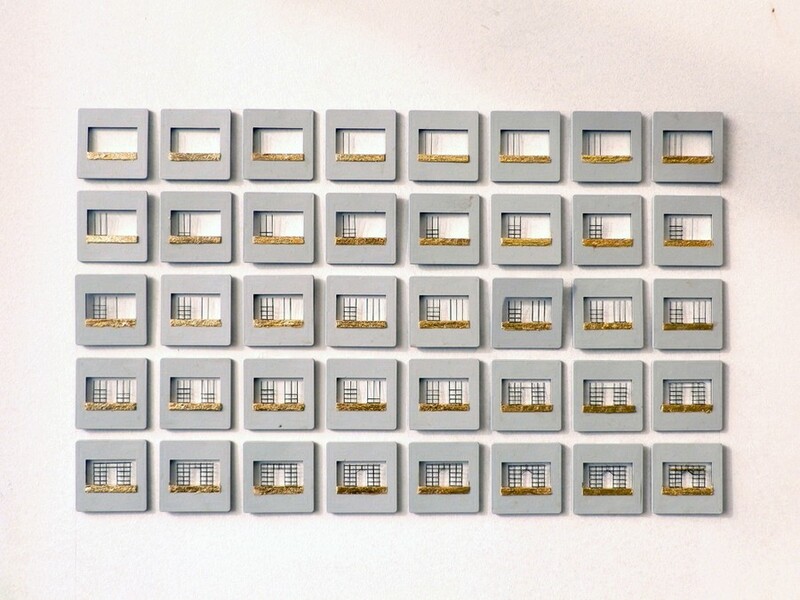 The final design solution required a precise construction programme in order to allow the existing factory to remain fully operational throughout. Work commenced on site in January 2014 and the production areas were handed over to the client at the end of September 2014, with full completion achieved in December 2014. The majority of the buildings on the site are simple in character, however the client agreed that the entrance building should take on a more expressive form. 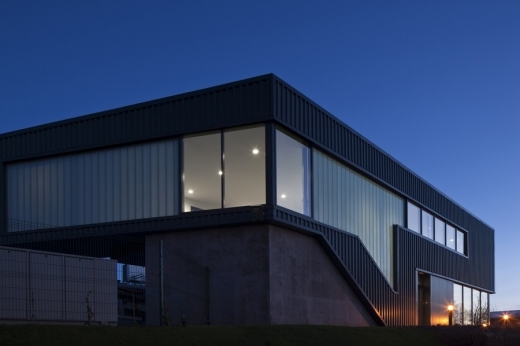 Clad in inexpensive ‘industrial’ materials it nonetheless has a dynamic and distinctive profile. The reception and waiting area now boasts picturesque views of the river below thanks to the installation of large glass panels while, on the upper level there is an exhibition kitchen, where new products are developed and sampled. 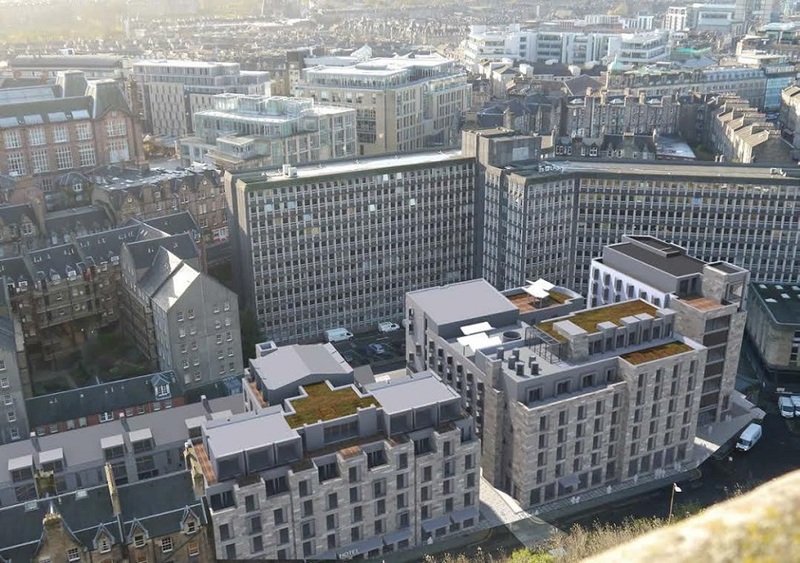 13 Oct – Seaforth Developments and Covell Matthews Architects have submitted plans for the creation of 88 student beds on the site of a C-listed granite building in Aberdeen city centre, reports Urban Realm. 13 Oct – Urban Realm has published the 2015 edition of the Architecture Scotland Annual , documenting a succession of public, housing, health, education, commercial, historic and interiors projects. 13 Oct – Graeme Massie Architects and Sutherland Hussey Harris have been jointly shortlisted along with AECOM for the redevelopment of a series of infilled city centre docks in Antwerp, Belgium, reports Urban Realm. 12 Oct – The Royal Incorporation of Architects in Scotland, the professional body for all of Scotland’s architects, will mark the centenary of its founding, next year. As part of a series of events to celebrate 100 years of architecture the Incorporation is asking the people of Scotland to nominate their favourite Scottish buildings from the last 100 years. 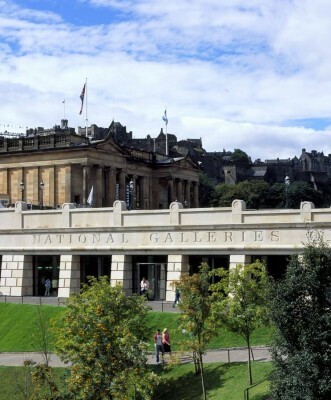 Members of the public are asked to email the name, address and architects (if known) of their favourite building in Scotland from between the years 1916–2015 (to liz.baillie@rias.org.uk). 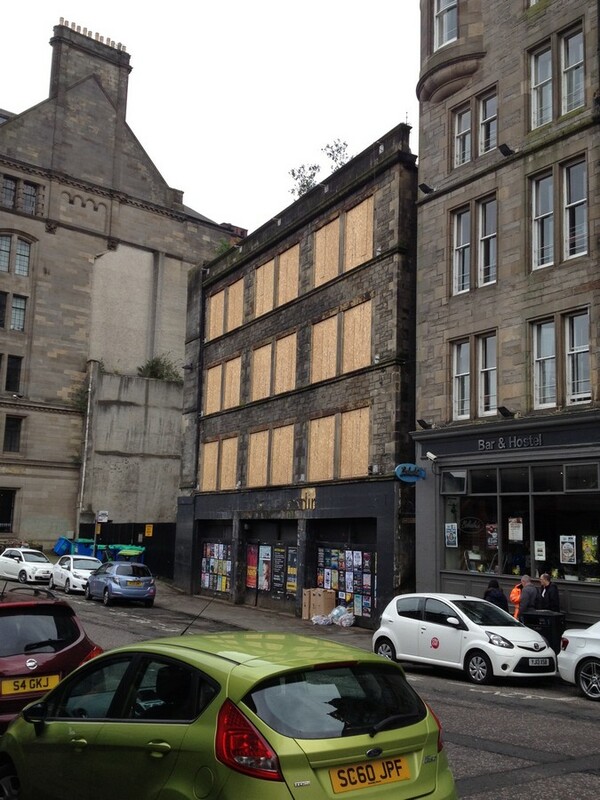 Buildings can be of any type located anywhere in Scotland but should be still standing. “The last hundred years have seen two world wars, the heady days of the 1920’s and 1960’s, economic ups and downs and now a shared desire for sustainability”. To celebrate the Centenary year of RIAS we are asking everyone in Scotland to nominate their favourite buildings and explain (in no more than 30 words), why they particularly like them. The top five submissions will each receive a voucher for £100.00 to spend in the Royal Incorporation’s Bookshop, which also stocks high quality gifts, cards, ceramics and Lego models. The deadline for submissions is 5pm, Friday 30th October 2015. 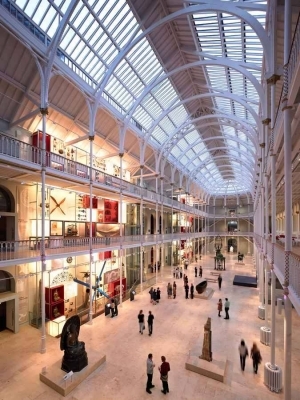 An expert panel of leading historians and architects will shortlist the top 100 Scottish buildings of the last century which will be announced on 3rd December at the launch of the Festival of Architecture 2016. 12 Oct – The last standing reminder of Edinburgh’s rubber mill is to be transformed into a printmaking facility after a grant of £4.5m was secured from the Heritage Lottery Fund (HLF) , reports Construction News Scotland. 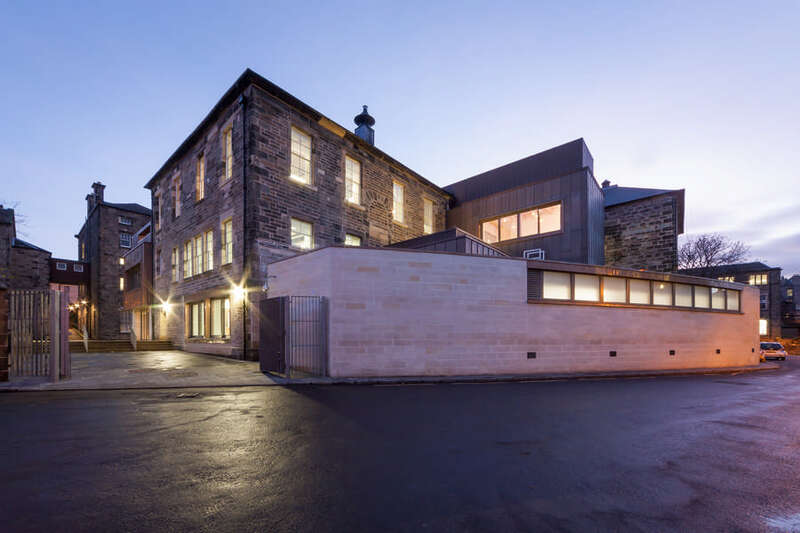 Renowned for being the birthplace of the Wellington boot, the modern motor car tyre, and the first ever traffic cone, the Castle Mill Works building will also feature a hub for creative enterprise and an arts centre with café, bar and learning spaces. 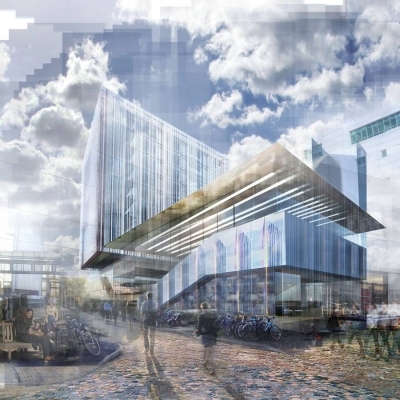 Plans were submitted to the City of Edinburgh Council for the new £10 million creative hub in Fountainbridge for Edinburgh Printmakers by Page/Park Architects back in July. 12 Oct – Plans to craft a visual arts centre and creative hub within a former Edinburgh rubber factory have received a £6m boost courtesy of the National Lottery, reports Urban Realm. Please visit the city’s consultation hub at the links below for more information and to respond to the changes. 12 Oct – A proposal for the UK’s first patented prefabricated timber frame party wall system is one of the first six innovation projects to be approved by Construction Scotland Innovation Centre’s (CSIC) Technical Advisory Group of industry and academic experts, reports Construction News Scotland. The new party wall system is the brainchild of Stewart Milne Group, which will receive almost £100,000 of investment by CSIC to help bring the product through the industrial research and development stage and onto the market. Glasgow Caledonian University and Edinburgh Napier University will contribute to product design and performance validation in a laboratory and site environment to analyse the product’s structural, acoustic, fire and thermal performance. 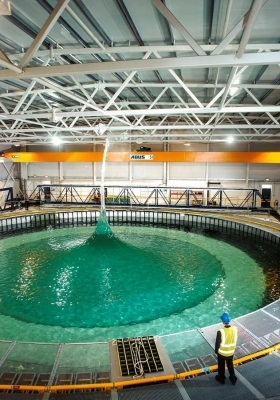 With a total value of over £800,000, the project has also levered £230,000 of government innovation funding from Innovate UK, bringing in additional industry collaborators and expertise. 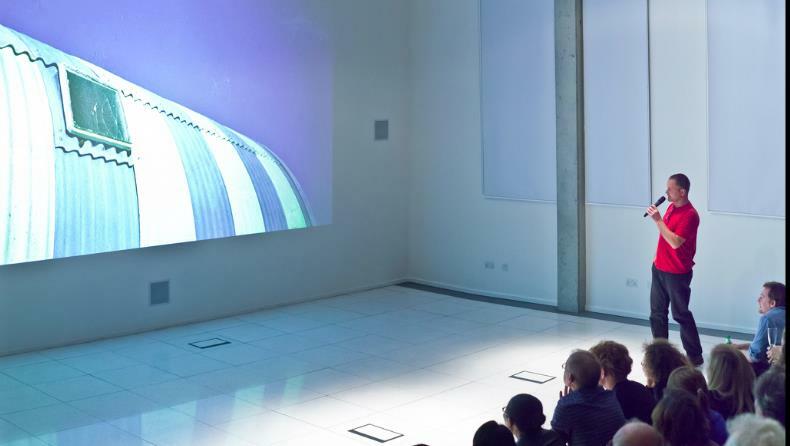 A light hearted look at the research and development within the interiors industry – comparing the theories, white papers and articles we read, and considering the contradictions and the implications on how we think about the organisation of space. Tsunami Axis and Boss Design invite you to contribute to the conversation, and look at how theory linked with practical workplace anthropology translates into the reality of space in modern Interior Design. Through observing human beings and our cultures we can compare and contrast the information and opinions – and perhaps expose and debunk the theories – leaving us better equipped to design. 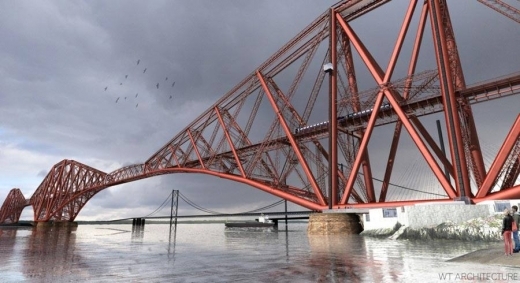 12 Oct – The winning entries for the third group of design competitions to be built as part of the widely acclaimed Scottish Scenic Routes initiative have been revealed, reports Construction News Scotland. Judges selected two designs from a shortlist of four for sites within the Cairngorms National Park at the Devil’s Elbow and Tomintoul adjacent to the AA93 and the A939 respectively. The winners each receive a prize of £5000 and a mentoring package from a Cairngorms National Park Authority design team and the Construction Scotland Innovation Centre. Daniel Smith and Philip Zoechbauer were announced as winners for Devil’s Elbow for their ‘A Languaue of Stone’ entry while ‘Connecting Contours’ saw Angus Ritchie and Daniel Tyler(Processcraft) emerge victorious at the Tomintoul site. Both projects will be built by Spring 2016. 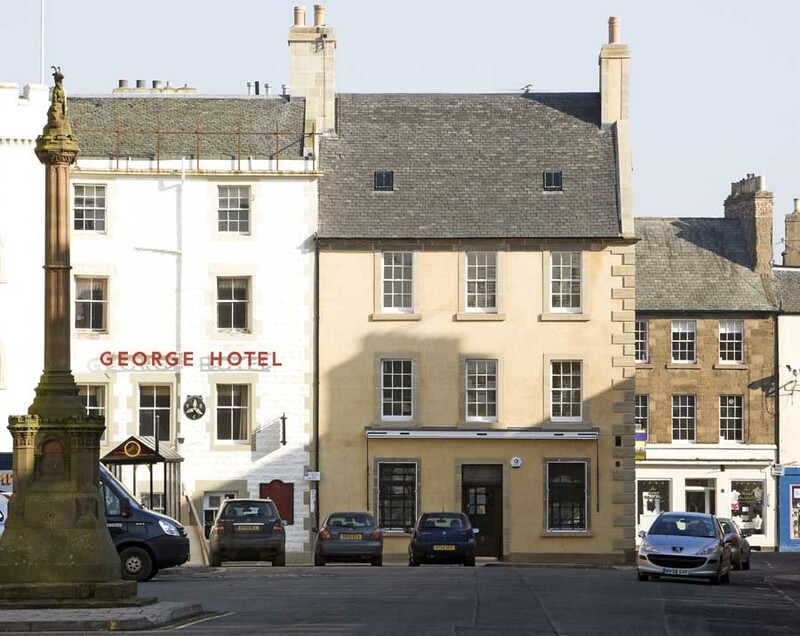 12 Oct – Plans have been submitted for the construction of a four-star hotel in Edinburgh’s Old Town, reports Construction News Scotland. 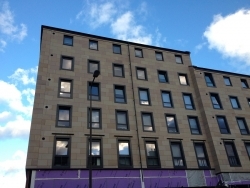 The 235-bedroom development will see a number of listed buildings bought back into use, and the space between Victoria Street and the Cowgate developed. Drawn up by ICA Architects on behalf of Jansons Property, the hotel would be at the heart of a £65 million regeneration push for the A-listed India Buildings on Victoria Street and surrounded by a new entertainment destination of bars, restaurants, cafes and public space. As part of the plan, The Cowgatehead Church is to be renovated and brought back into use as the function facilities for the new hotel. 11 Oct – Glasgow’s Red Road flats to be demolished by explosion reports BBC Scotland. Glasgow’s skyline will be changed later with the demolition: the six remaining high-rise blocks will be brought down together by controlled explosion. 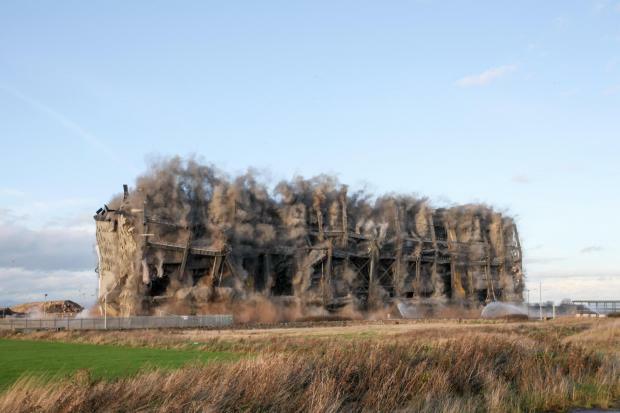 GHA said that after the controlled explosion 10 storeys of the blocks would remain and would be demolished using machinery at a later stage. “You will be pleased to hear that the council have backed the plan to turn the City Hall into a Market Hall. This has been grudgingly accepted by the council and a three month period has been given to Perth Market Place Ltd in order to satisfy the council that funding is in place for the venture. 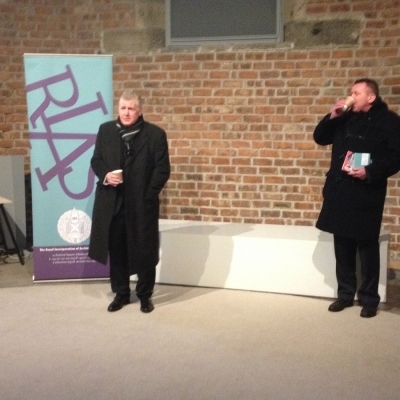 “It is with sadness that the Edinburgh Architectural Association announces the death of Ian M.T. Samuel. Ian passed away peacefully at home in Glasgow on Friday, 2nd October 2015, aged 85 years. 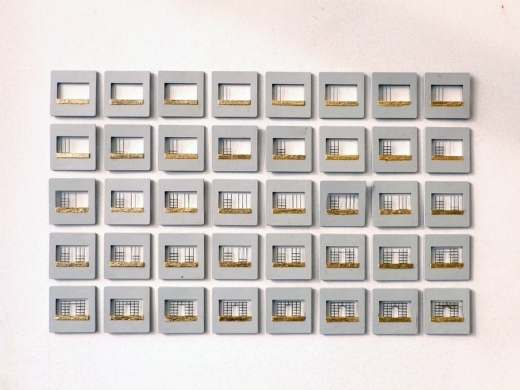 Ian studied at the Edinburgh College of Art in the late 1940s and worked professionally as an Architect and Town Planner in London, Edinburgh and Glasgow from the 1950s to 1980s, working largely for Robert Matthew Johnson Marshall and Partners. In the eleven years prior to his retirement in 1990 he worked for Glasgow City Council as architect/planner in the Planning Department responsible for conservation services and listed building repair work. He was the loving husband to Helen and much beloved father to Mhora and Marie. He grew up in Newtongrange, Midlothian as the younger brother to May and Andrew. 9 Oct – Tickets are on sale now for Ghost Peloton Glasgow on 12 and 13 November at the Whisky Bond, Port Dundas. Ghost Peloton Glasgow marks the first staging of NVA’s Speed of Light in Scotland since the work’s premiere on Arthur’s Seat in 2012 – more on the Glasgow Architecture site’s news page. 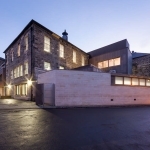 9 Oct – Contemporary arts organisation Collective has employed their architectural namesake Collective Architecture to pick up the reins of a redevelopment of Edinburgh’s City Observatory. 9 Oct – INCH Architecture have submitted plans for a £3.4m new club house and mountain bike trails at The Hermitage Scotland, an existing public golf course in Edinburgh, reports Urban Realm. 8 Oct – Planners have approved £3.5 m proposals to create a new contemporary visual arts space at the City Observatory complex on Calton Hill, reports Construction News Scotland. The creation of a new-build gallery and restaurant will see one of Edinburgh’s most iconic sites open to the public for the first time in its history. 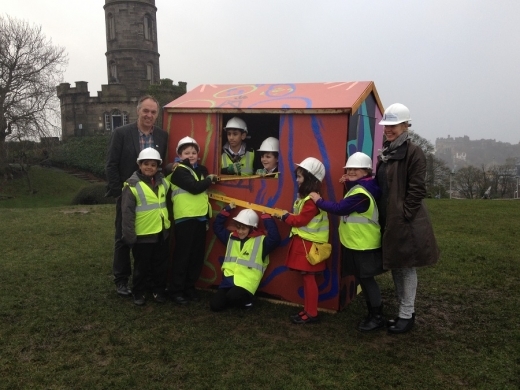 Contemporary visual art organisation and gallery, Collective is working in partnership with the City of Edinburgh Council to redevelop the City Observatory as their new permanent home. 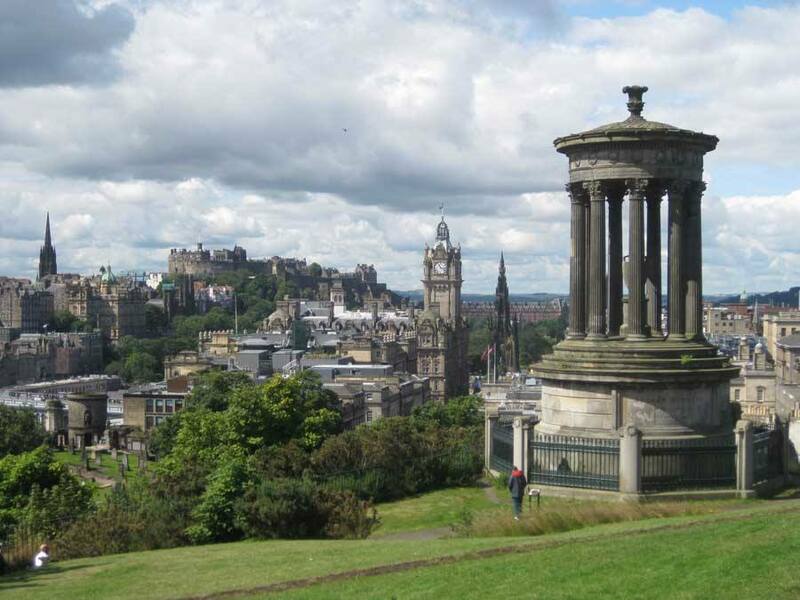 The City Observatory sits on Calton Hill, one of Scotland’s first public parks and is a jewel in the crown of the UNESCO World Heritage Site. It was the birthplace of astronomy and timekeeping in Edinburgh and forms a vital component in the group of buildings on Calton Hill. The redevelopment design was by Malcolm Fraser Architects, we hope to confirm details on any new architectural arrangements soon. 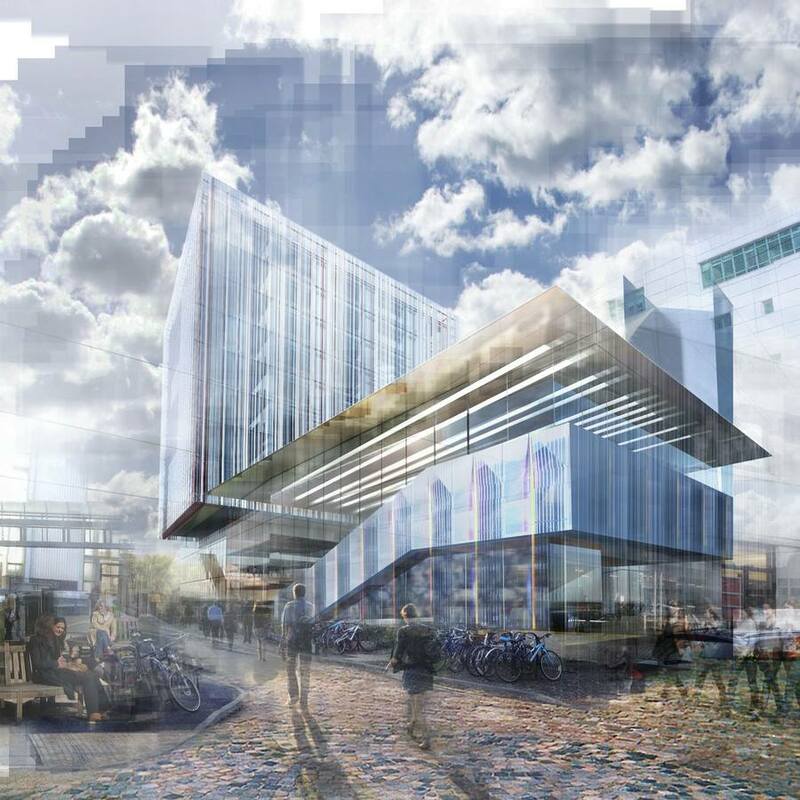 8 Oct – We were advised today by e-mail of plans now with Glasgow City Council, to apparently build a 10 storey hotel complex “with massive interactive billboards on the street and blocking vies of the now iconic buildings at Finnieston Street.” – more on the Glasgow Architecture site’s news page. 7 Oct – Scottish Borders Council has unanimously approved £6m plans to build permanent home for the Great Tapestry of Scotland at Tweedbank, reports Construction News Scotland. 7 Oct – Plans for a new headquarters and civic space in Falkirk took another significant step forward after the local authority submitted plans for a new building on the site of the former Westbank Clinic on West Bridge Street, reports Construction News Scotland. 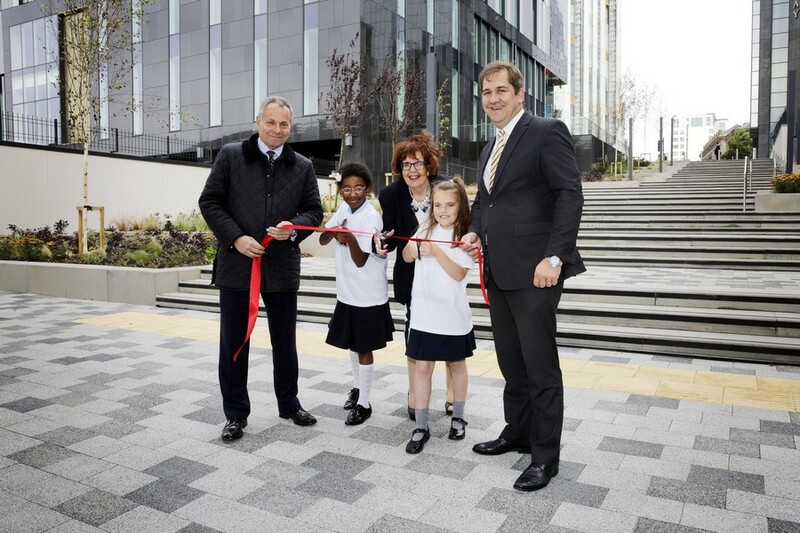 5 Oct – Abstract (Glasgow) Ltd – a wholly-owned subsidiary of Mark Glatman’s Abstract Securities Ltd – has announced that it has officially launched its new public space as part of the construction of its St Vincent Plaza office development. 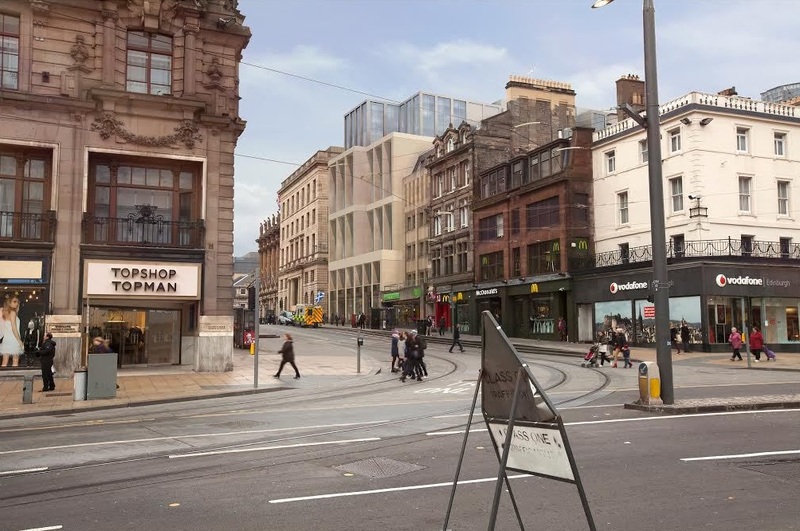 The new public space now links William Street to St Vincent Street, improving access from Hilton Glasgow to the International Financial Services District (IFSD) and all that the City Centre has to offer – more info on the Glasgow Architecture site’s news page. 2 Oct 2015 – Plans for a new East Lothian Community Hospital have been given the green light by the Scottish Government. The Initial Agreement for the project has now been approved and the project team will now work on preparing the business case for the project. The £75m Community Hospital will provide orthopaedics and stroke rehabilitation, enhanced imaging, and a social care day unit. Construction on the site could begin in 2015, with services operational by the end of 2017. 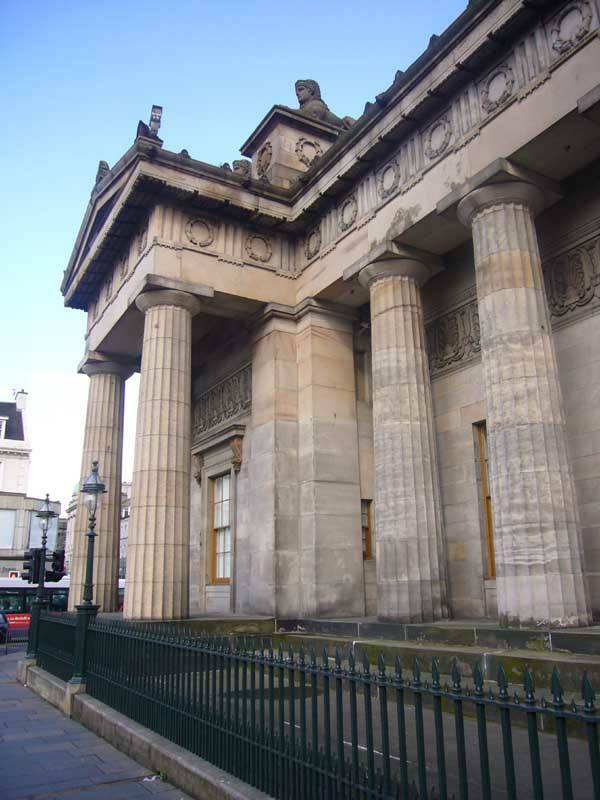 2 Oct – The long-running conclusion to the future of Perth City Hall will move closer next week when councillors consider plans to transform the building into a food market or a hotel, reports Scottish Construction News. 1 Oct – The Scottish construction industry is growing at its strongest rate in over 5 years. Construction contracts in Scotland in the past 12 months have outperformed most other parts of the UK, as the economy returns to pre-2008 levels and the Scottish government makes significant infrastructure investment. 30 Sep – Leading Scottish architect Malcolm Fraser, renowned for high profile masterplanning, cultural renewal and regeneration work, has joined Halliday Fraser Munro, reports Scottish Construction News. With offices in Aberdeen, Dundee, Edinburgh, Glasgow and Belfast, Halliday Fraser Munro continues to enjoy strong, sustainable growth across the public and private sectors with commissions for masterplanning, residential, commercial, student accommodation and hotels throughout Scotland. 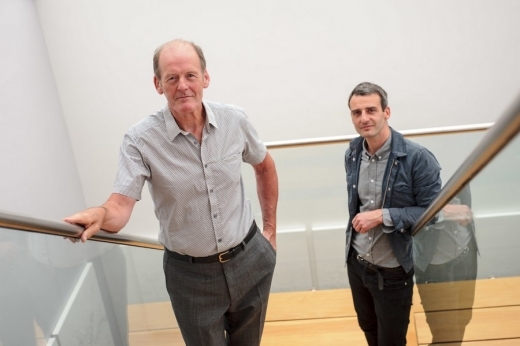 The firm has appointed Malcolm Fraser following the closure of his practice after 22 years in business in a move that shocked many in architectural circles. The Edinburgh-born architect, who has won multiple awards and recently led the Scottish Government’s Town Centre Review, will join Halliday Fraser Munro this week. 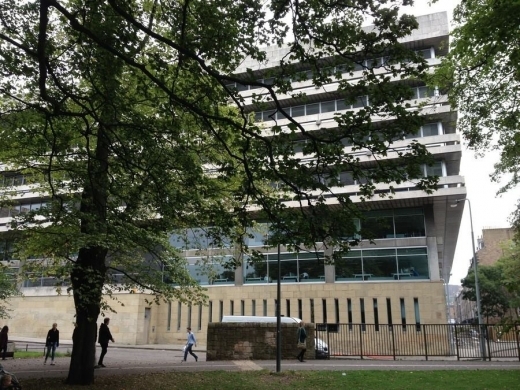 30 Sep – Two directors at Edinburgh architecture firm RMJM have been found guilty in a Hong Kong court of failing to pay staff wages, reports Scottish Construction News. Peter Morrison and Declan Thompson were each fined HK$93,000 (about £7,900) for the offences, which included failing to honour ‘termination payments’ and not settling previous awards by the Labour Tribunal. The pair were also ordered to pay out HK$1.5 million (about £125,000) in outstanding payments and tribunal awards to the employees. 30 Sep – Construction services company ISG has commenced additional projects in the east of the country for the University of Edinburgh, reports Scottish Construction News. After successfully completing the first phase of the Ashworth building redevelopment for the School of Biological Sciences, ISG is now commencing the second phase, valued at £1m. Encompassing the three remaining levels of the five-storey building, the contractor will reconfigure existing accommodation to create high-specification office and laboratory space. 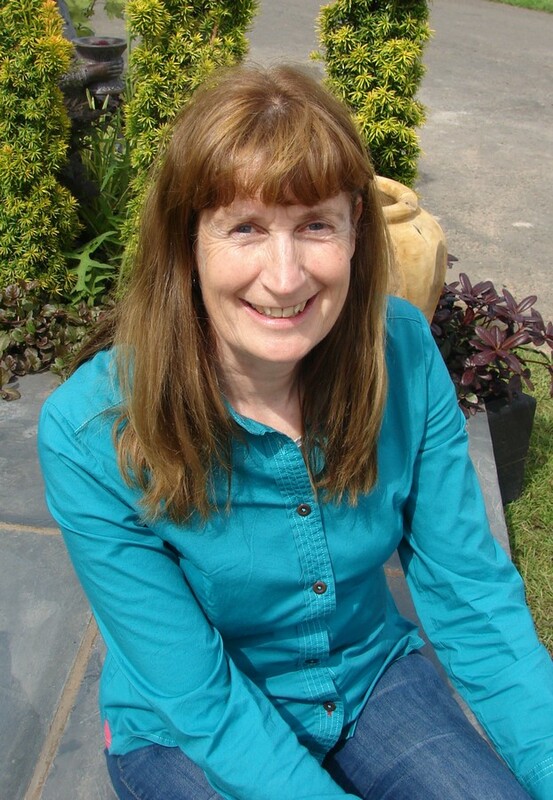 The University has also awarded ISG a £1.2m project at the Michael Swann Building, which also forms part of the prestigious School of Biological Sciences. 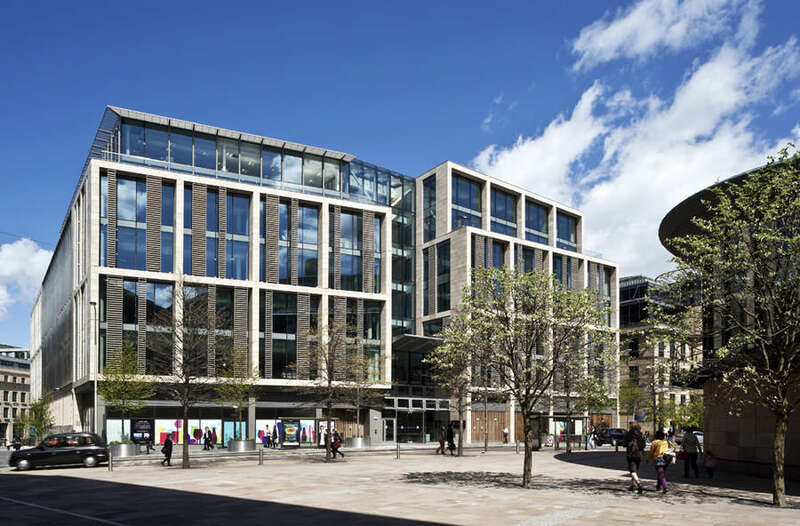 30 Sep – Ryden has signed a lease at The Exchange in Edinburgh and will relocate its HQ to the city’s business district in October, reports Scottish Construction News. 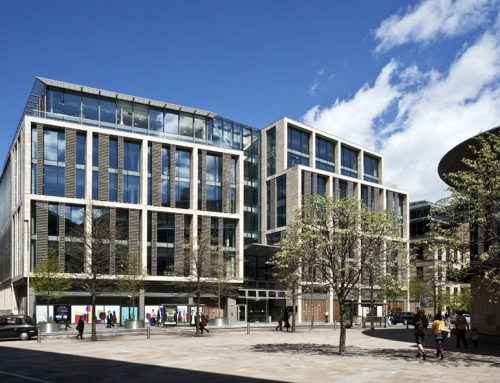 A 10-year lease has been agreed for the 582sq m ground floor of 1B Exchange Crescent, 7 Conference Square following the firm’s 25 years at North Castle Street; All 45 Edinburgh staff will relocate. 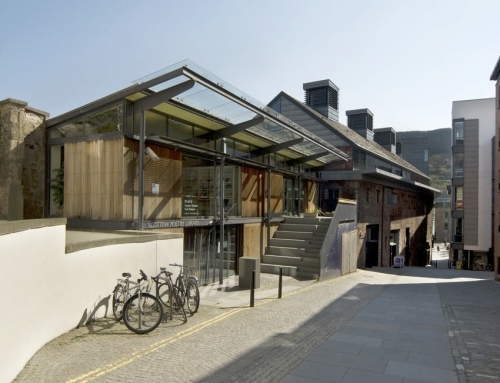 29 Sep – Rothesay Pavilion on the Isle of Bute has closed as work begins to transform the building into a cultural centre, reports Construction News Scotland. 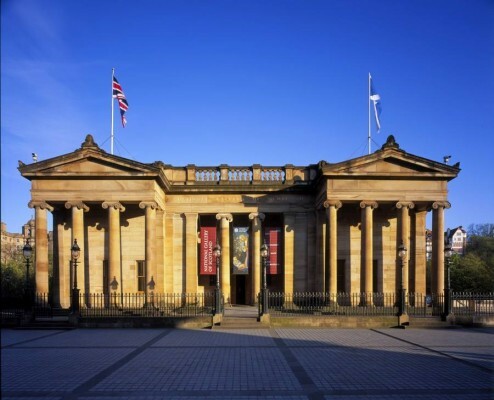 Designed by Glasgow architects Elder and Cannon, the two-year £8m refurbishment programme will see major repairs to the Grade-A listed building, a second performance venue and a new top floor for meetings and conferences. The revamp, led by Argyll and Bute Council and the Prince’s Regeneration Trust, was made possible after a Heritage Lottery Fund grant of £3.33m brought the funding drive towards its target back in February. 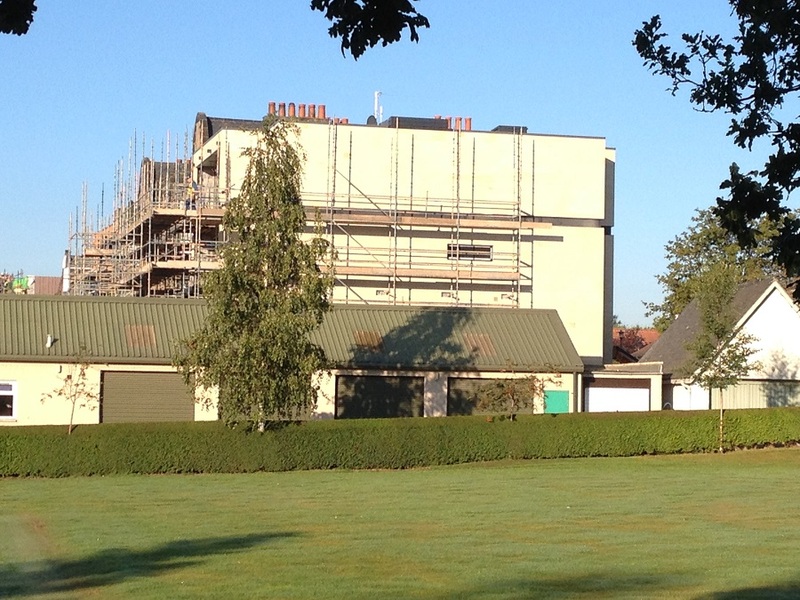 The pavilion building is scheduled to re-open in summer 2017. 28 Sep – Murray Estates has submitted proposals for the first phase of a £1 billion “Garden District” in Edinburgh, reports Scottish Construction News. 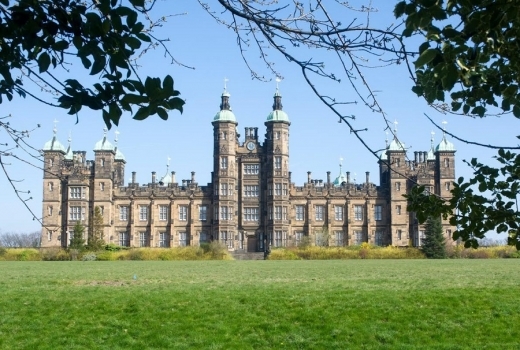 Plans by the development firm owned by Sir David Murray (formerly head of Premier Property) include 1500 homes and a new primary school on land next to Edinburgh Park and the Royal Bank of Scotland headquarters at Gogarburn. A quarter of the initial development – 375 properties – will be affordable housing, with the remainder split between private homes and apartments. 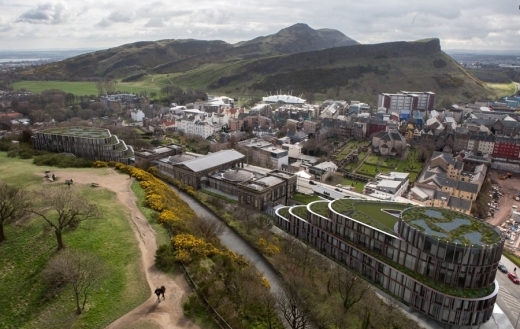 The plan is part of a larger project which could see up to 6000 homes built in the west of Edinburgh. The overall plan also features a 60-acre National Garden – known as the Calyx – which would include water features and research facilities. Murray Estates said they would aim to be on site for the first phase by 2017 if planning approval is secured. 28 Sep – A former construction management student at Robert Gordon University (RGU) has played a key role in the university’s newest addition to its multi-million pound campus development, reports Scottish Construction News. Ewan McDonald, 32, spent six years working as a bricklayer before making the decision to study Construction Design and Management at RGU’s Scott Sutherland School of Architecture and Built Environment. Eight years after graduating and Ewan found himself back at the university’s Garthdee campus – this time in the role of project manager with Kier Construction for the build of the new Scott Sutherland School. 28 Sep – A five month search to find the most innovative projects in the built environment throughout Scotland is now on following the launch of the RICS Awards 2016, reports Scottish Construction News. The annual awards celebrate the most inspirational built developments from across the country that provide real value to the communities they serve. The Grand Final Awards are held in the Dorchester, London in October. 24 Sep – A major battle is brewing as leading contemporary and conservation architects collaborate on an alternative to the controversial design by Glasgow’s Gareth Hoskins Archiects. Set against a backdrop of an impending ICOMOS visit to Edinburgh to check on the World Heritage site status this controversy is the ‘new Caltongate’, though the St James Quarter’s ‘walnut whip’ is giving it a good run for its money. 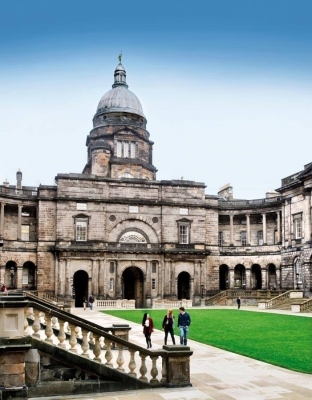 The Royal High School Preservation Trust (RHSPT) has appointed Richard Murphy Architects and Simpson & Brown to develop alternate proposals for the restoration of Edinburgh’s former Royal High School. Backed by the Dunard Fund charitable trust (run by Carol Høgel, an American touring concert pianist and long-time fan of Richard Murphy), the Trust has made a formal legal offer of £1.5 m to buy the iconic buildings and will pursue plans to restore the site for St Mary’s Music School. The Trust intends to submit a detailed and fully funded application to the City of Edinburgh Council as soon as possible. The vision will provide an alternative to Hoskins Architects’ £75m plans to turn the school into a hotel. 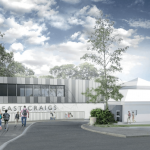 24 Sep – The vision for a new Meadowbank Sports Centre has moved a step closer after the City of Edinburgh Council revealed the funding shortfall has dropped dramatically, reports Scottish Construction News. 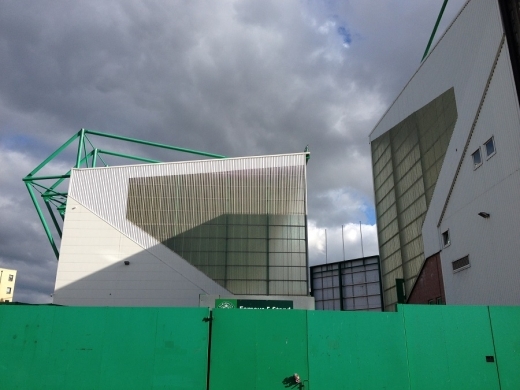 According to a report in February, the estimated cost of the project was £43 m with a funding shortfall of around £11 to 20 m. Now the latest Meadowbank report, which will be discussed by the council’s corporate policy and strategy committee next week, has revised the figures to £42m with a shortfall of £6.8m. The council attributed the change to increasing land values, a modified and re-costed design and the lack of significant issues resulting from the intrusive ground survey. 24 Sep – Architect Zaha Hadid has become the first woman to be awarded the prestigious Royal Gold Medal by the Royal Institute of British Architects (RIBA), revealed e-architect first thing this morning. Dame Zaha Hadid will receive the 2016 Royal Gold Medal in recognition of her lifetime’s built, theoretical and academic work. 24 Sep – Edinburgh’s City Observatory and the Govanhill baths in Glasgow are among six Scottish projects to be restored thanks to investment from the Heritage Lottery Fund (HLF), reports Scottish Construction News. 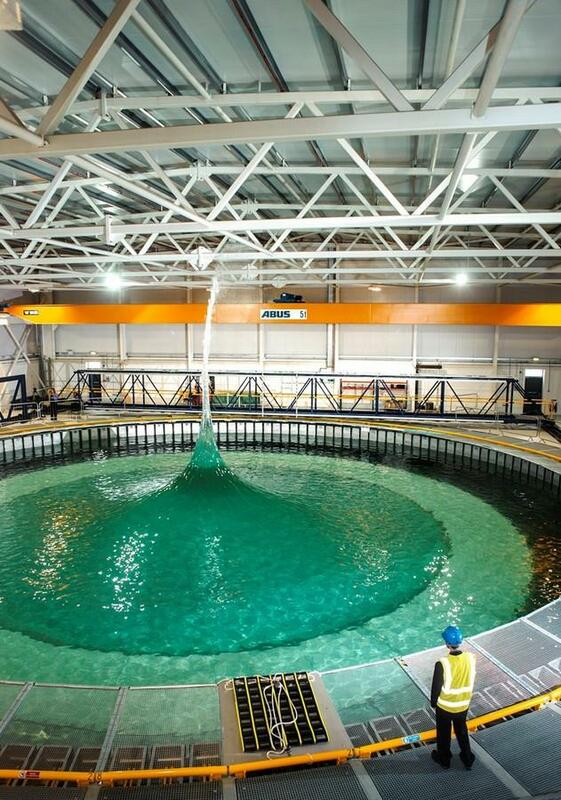 A total of £7m is being made available for projects across Scotland. The City Observatory on Calton Hill in Edinburgh, currently on the buildings at-risk register, is to receive £1.3m to create a visual art gallery space. The complex will also include the original telescopes, which will be restored, an education space and heritage trails and viewpoints leading to it. 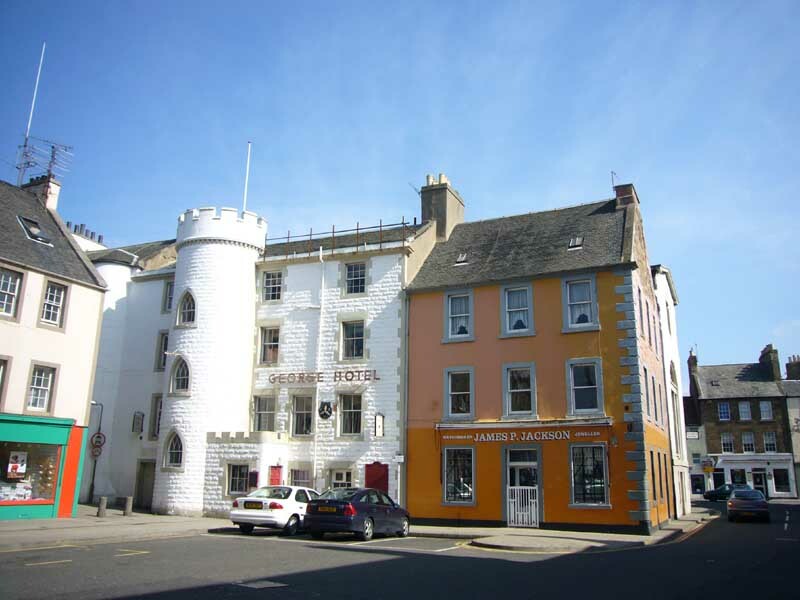 Other projects receiving funding include Kirkcudbright Art Gallery, Academy Street in Inverness, Govanhill baths in Glasgow, the Davidson Cottage Hospital, Girvan and the Fife Pilgrim Way. 23 Sep – An Edinburgh architecture firm has developed a design manifesto for the country’s burgeoning food and drink industry, aiming to bring the benefits of good design and architecture to manufacturing businesses, reports Scottish Construction News. 25 Sep – Work to build a new distillery and visitor centre in Tarbert , Isle of Harris, has concluded with an official opening ceremony, reports Urban Realm. 25 Sep – A number of design teams have been assembled to pursue the prestigious £66m contract to overhaul Glasgow’s Burrell Collection, reports Urban Realm. 24 Sep – Industrial specialists Taylor Architecture Practice (TAP) has been appointed to extend an existing fish distribution centre in Larkhall by 2,500sq/m to provide additional cold storage and loading, reports Urban Realm. 23 Sep – Edinburgh based co-design studio Here + Now, a team of landscape architects, designers and photographers, is to repurpose a disused railway tunnel in Edinburgh for a month, reports Urban Realm. 23 Sep – Richard Murphy Architects have handed over the final phase of Anglia Ruskin University’s Young Street campus, Cambridge, reports Urban Realm. 22 Sep – 7N Architects have submitted plans to build 52 homes on brownfield land at Fishwives Causeway, Portobello, on behalf of Cruden – fulfilling the affordable housing requirement of a wider site, reports Urban Realm. 22 Sep – Morgan McDonnell Architects have submitted revised plans on behalf of Square and Crescent for a residential conversion and extension of 235 Corstorphine Road, a B-listed former Barnardos, reports Urban Realm..
22 Sep – Network Rail is pressing ahead with its £104m redevelopment of Queen Street Station, despite plans to remodel Buchanan Galleries being thrown into doubt, by submitting plans for the demolition, reports Urban Realm. 22 Sep – A recent design for Blackwood Housing by Lewis & Hickey’s Edinburgh office was showcased at their AGM held at Edinburgh’s Dynamic Earth. A scale replica of a highly accessible concept house for people with disability or mobility issues was part of the ‘Innovation of Home and Care Expo 2015’. 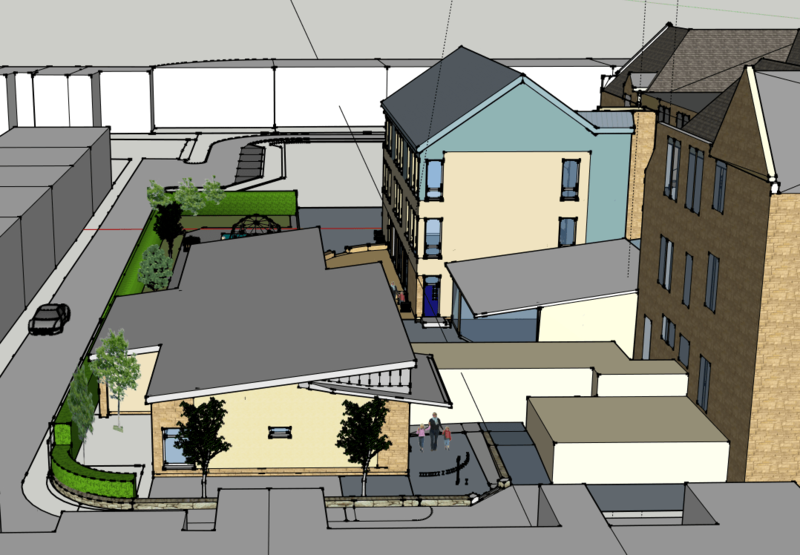 The housing and care provider is planning to construct a pilot scheme of the concept house in Dundee, in the near future. 22 Sep – MLA has promoted Adam Frickleton to associate director and Garth Fitzsimons to associate architect. Adam Frickleton joined the practice in 2003 and since then has become a key member of staff working on the design and delivery of some of Scotland’s major commercial and educational projects. He is currently working in Glasgow on the new City of Glasgow College. Garth Fitzsimons joined MLA in 2013 and has successfully driven some complex projects including a new hotel & retail development in St Andrews and the regeneration and conservation of the category A-listed Corn Exchange building in Dalkeith. 22 Sep – Midlothian Council has unanimously granted planning permission to FCC Environment (UK) Ltd for the construction of a waste recycling and combined heat and power plant on former railway marshalling yards at Millerhill. 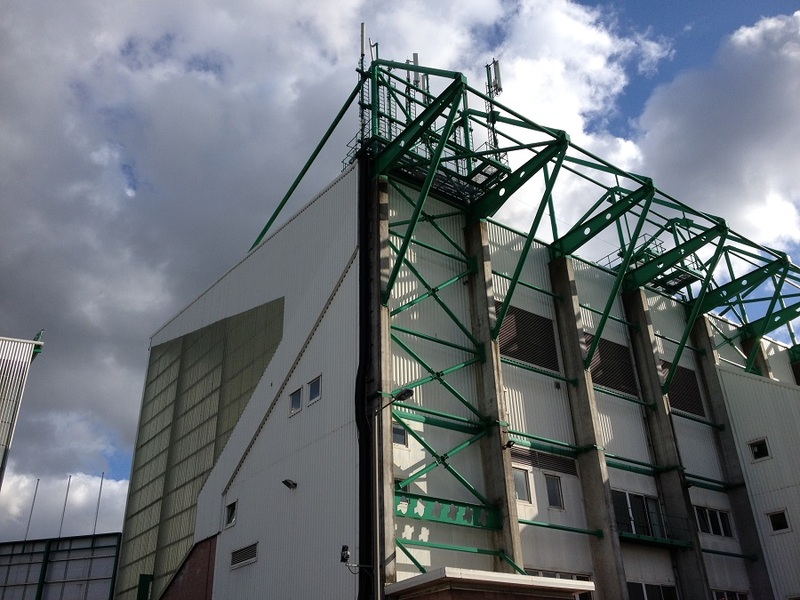 FCC Medio Ambiente SA was appointed preferred bidder in Dec 2014 for the contract to design, build, finance and operate facilities to treat and recover value from all the waste collected by City of Edinburgh and Midlothian Councils that currently goes directly to landfill. This 25-year contract will involve the thermal treatment of up to 135,000 tonnes of mixed waste annually to produce electricity for the National Grid and heat suitable for a district heating scheme, with less than 5% of all waste going to landfill in line with Scottish Government targets. 22 Sep – More than 1,000 affordable homes for rent with a total value of £146m have been delivered through the National Housing Trust initiative (NHT) over the last four years.The scheme is on track to deliver more than 2,000 NHT homes in communities across Scotland. 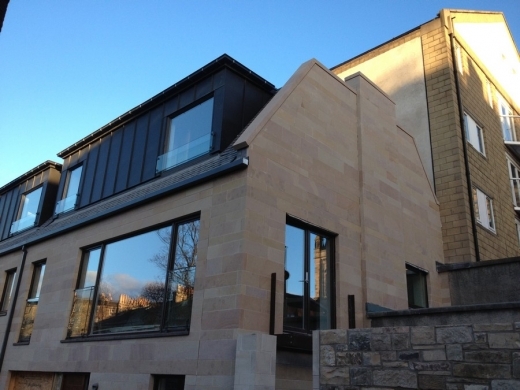 The milestone was reached with the completion of homes in Westercraigs, Inverness. The Scottish Government and the Scottish Futures Trust, developed the original NHT model for councils and developers. 21 Sep – Responding to today’s announcement that the UK Government wants to see a million homes built across England by 2020 in order to tackle the housing crisis there, Homes for Scotland Chief Executive Philip Hogg said “With the number of new homes built north of the border having fallen by 40% since 2007, Scotland faces the same challenges as those being highlighted in England today. As numerous reports have identified, hundreds of thousands of new homes are needed here over the next twenty years to meet the diverse housing needs of our growing population. More details on the Glasgow Architecture website news page. 21 Sep – We are back up and running after a difficult server migration, more news online shortly. A computer-generated fly-through shows the outside of the building, the layout and facilities on offer to visitors. 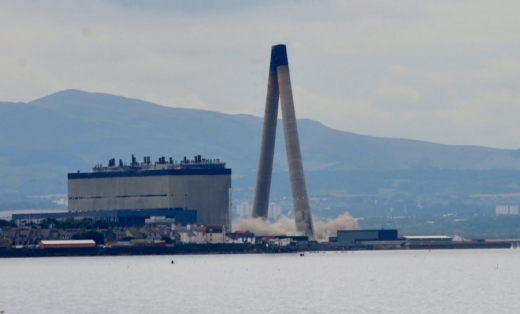 Plans for the V&A at Dundee are to go on show at the 2015 London Design Festival. V&A Dundee’s new display, “Architecture Now: V&A Museum of Design Dundee” incorporates this newly commissioned visualisation allowing visitors to experience and explore the developing Dundee waterfront and interior of V&A Dundee. Part of the V&A + RIBA Architecture Partnership it will remain on display at the V&A Architecture Gallery until Spring 2016. 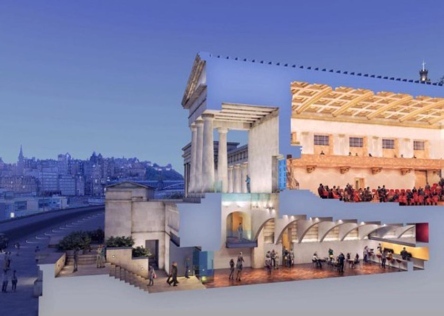 The new virtual tour created by Edinburgh-based Luma3Di, allows viewers to sweep in to the new museum from the River Tay, through the main hall and up to the first floor to see the public spaces, learning suite and restaurant, revealing new interior detail for the first time. An accompanying film featuring V&A Dundee Director Philip Long completes the display. Including new footage from the museum’s construction site, the film explores Dundee’s industrious heritage, ongoing 30-year waterfront redevelopment plan and recent status as a designated UNESCO City of Design. 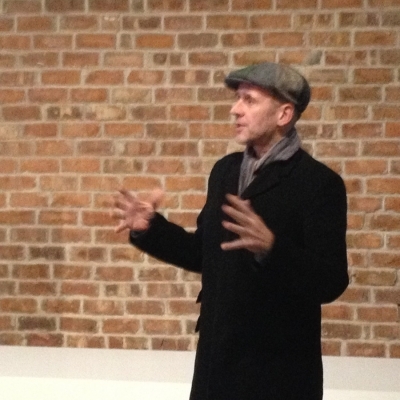 “This is a fantastic opportunity to communicate with a new audience, many of whom may not have visited Dundee before. We believe V&A Dundee will be one of the must-see buildings of 21st century Europe. 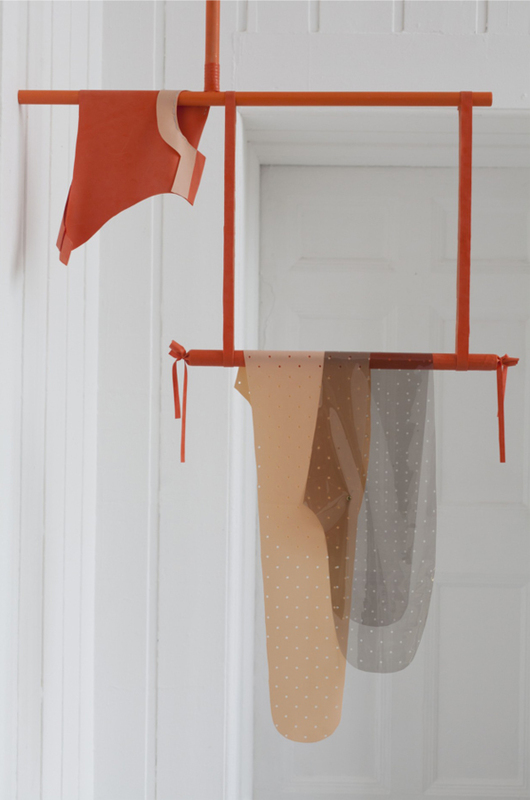 It will bring together outstanding design materials from the V&A’s world-renowned collections with loans from across Scotland, as well as showcasing extraordinary design exhibitions from the V&A. “The major investment in V&A Dundee will bring real benefits for the city and I am looking forward to seeing Kengo Kuma’s breathtaking vision become reality beside the River Tay. “Dundee’s profile is already benefiting from our association with the V&A. This can already be seen with the award of UNESCO City of Design status which reflects our growing international reputation. Architecture Now at the V&A is a changing display in partnership with RIBA, showcasing the innovative and the inspirational in architecture today – how changing needs, conditions and technologies contribute to and shape the development of the built environment around us. Key funders of the project to develop V&A Dundee include the Scottish Government, the Heritage Lottery Fund and Creative Scotland. 18 Sep – Purcell has lifted the lid on a contemporary family home in suburban Edinburgh, squeezed into a narrow plot sandwiched between two existing houses, reports Urban Realm. 18 Sep – City of Glasgow College has taken possession of its £50m Riverside Campus following its handover by contractor Sir Robert McAlpine on time and on budget, reports Urban Realm. 14 Sep – Yeoman McAllister Architects have submitted plans for a new care home on behalf of the Care Concern Group at 18 Whitehouse Road, Edinburgh, within the Cramond Conservation Area, reports Urban Realm. Sporting a rendered exterior with timber cladding and reconstituted stone detailing the 61 bedroom facility is located within an established residential neighbourhood, facing a steep wooded embankment down to the River Almond. An unlisted detached home dating from the 1960s/70s set within 0.48 hectares of land will be demolished to make way for the scheme. 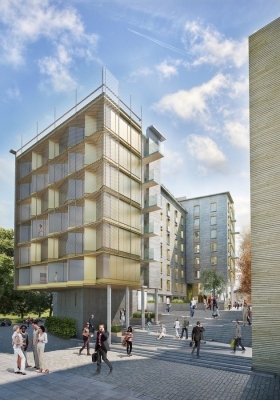 14 Sep – A new 92,000 sqft student housing development is set to be built in Edinburgh following a £19m investment secured by Maven Capital Partners. The firm will act as the asset manager on behalf of IP Investment Management (IPIM), a Singapore-based Investment Fund, on the scheme which will see 255 purpose-built bedrooms built on Gorgie Road by Summer 2017. 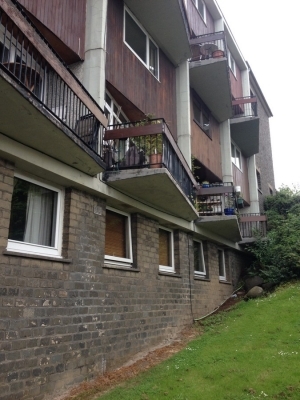 There are an estimated 34,000 students in Edinburgh who do not have access to university halls of residence or purpose-built accommodation. 14 Sep – Construction work on a £21.4m new high school in the Scottish Borders has been delayed until 2016 as a result of a European ruling affecting investment projects across the country, reports Scottish Construction News. 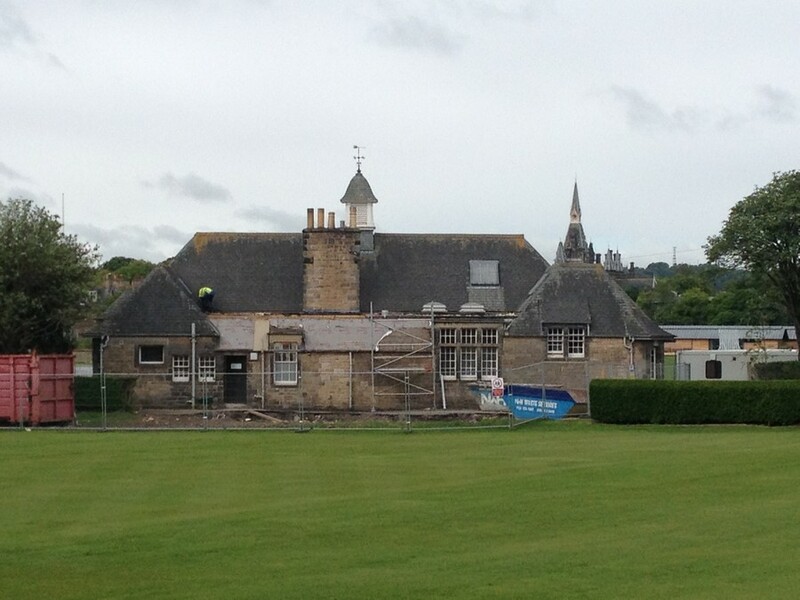 Scottish Borders Council, had hoped to start work on the new Kelso High School building this summer having secured planning permission in October 2014. However the European ruling means schemes which have been given investment through the Scottish Futures Trust and were previously treated as private sector projects must now be considered as being public sector funded. 10 Sep – Keppie have resumed their collaboration with Abstract following their work at St Vincent Plaza, Glasgow, by preparing designs for a 60,000sqft office development within a secure zone at Rosyth Dockyard, Fife. This will see the existing Navy House demolished and replaced with Grade A office space for occupation by Babcock Group. 31 Aug – Juniper Court, the fourth residence block for Stirling University Campus was handed over to the University on Friday. The building contains 251 en-suite bedrooms, 15 of which are accessible. A large south facing double-height foyer looks out onto a courtyard which overlooks Airthrey Loch to the Wallace Monument. The timber structure is clad in ivory-coloured Forticrete blockwork, with lower sections of spruce blockwork and Portland stone feature bands at every floor. Integral bat boxes have been included on the building due to a resident population. 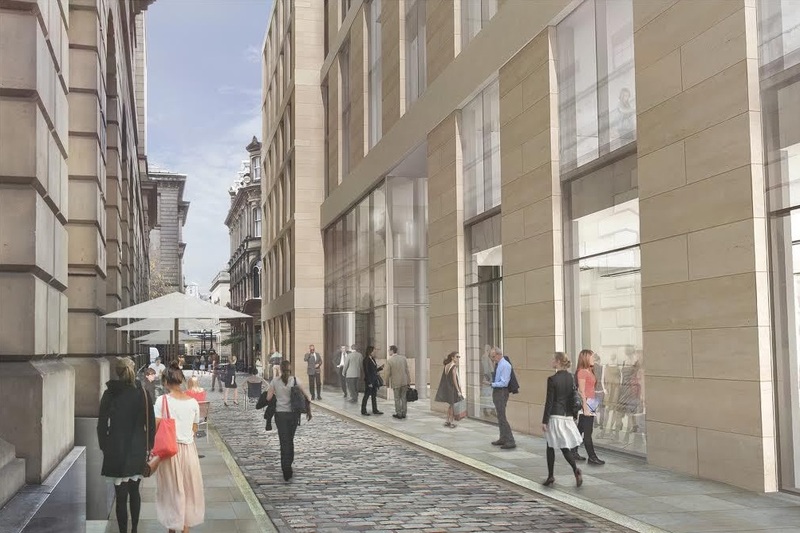 18 May – Grzywinski+Pons have been granted consent and approval for their forthcoming project in Scotland with a unanimous vote from the Edinburgh City Council.